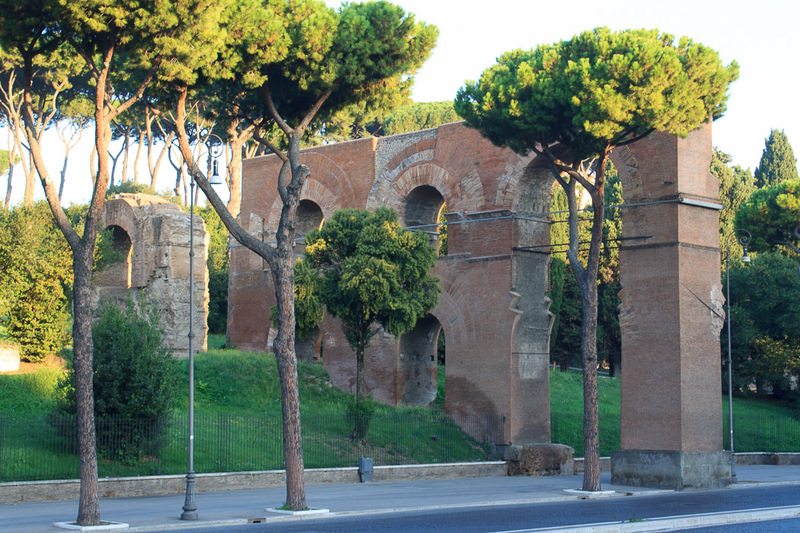 My Southeastern Sights Walking Tour starts at the beautiful park in southern Rome where the best view of aqueducts can be found, and follows the course of that aqueduct into Rome, stopping at two major basilicas of the Vatican, at the spot where the aqueduct enter the Aurelian wall, and at more interesting sights on the way to Termini, where the tour ends. 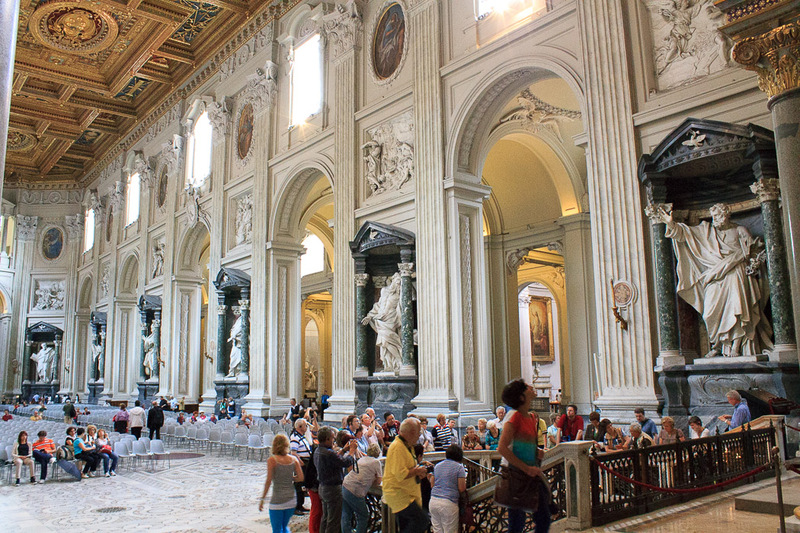 It will probably take all day to take this tour, and will involve a few miles of walking. 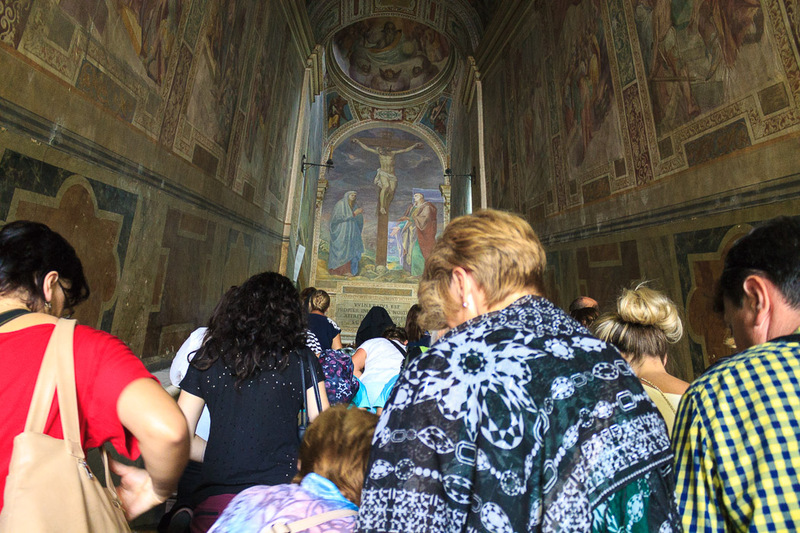 Start your day early to be sure you can see everything on the tour. 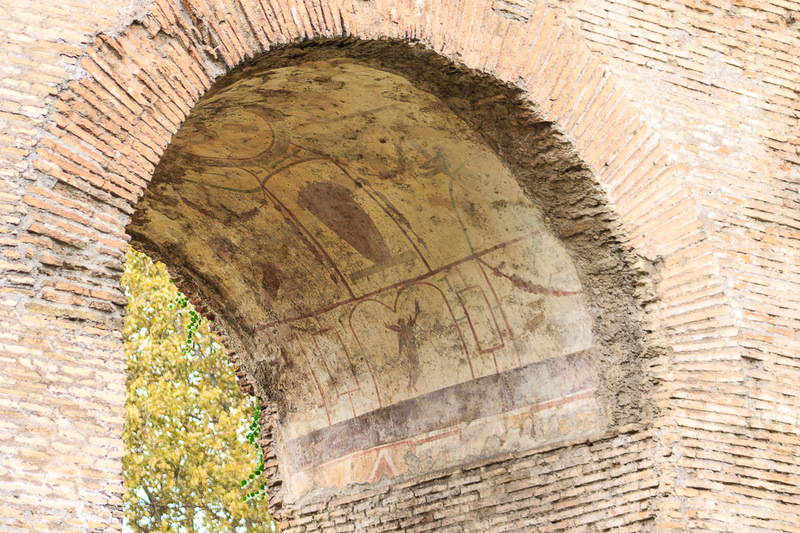 Aqueduct park is always open, so you could arrive, say, a half hour before sunrise! 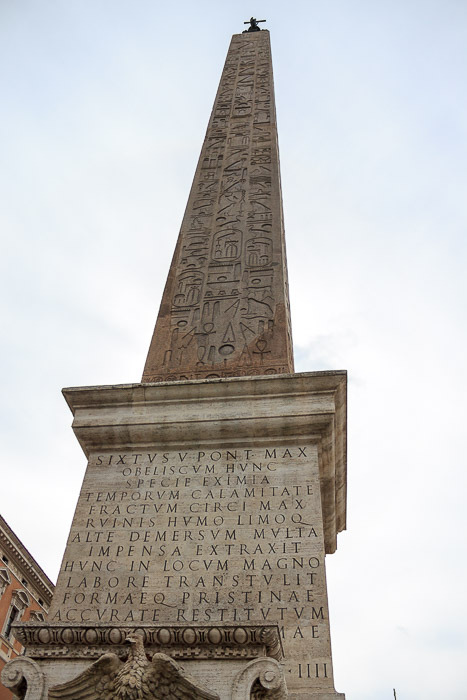 For directions, read the first paragraph below. 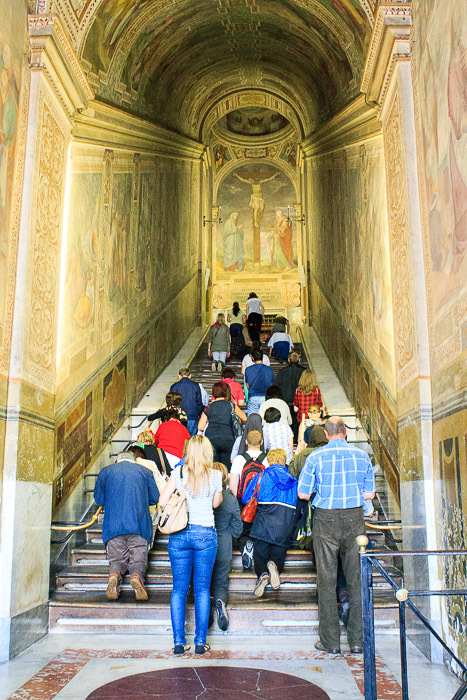 Ride the metro back north toward Battiistini, and get off at the 11th stop, San Giovanni. 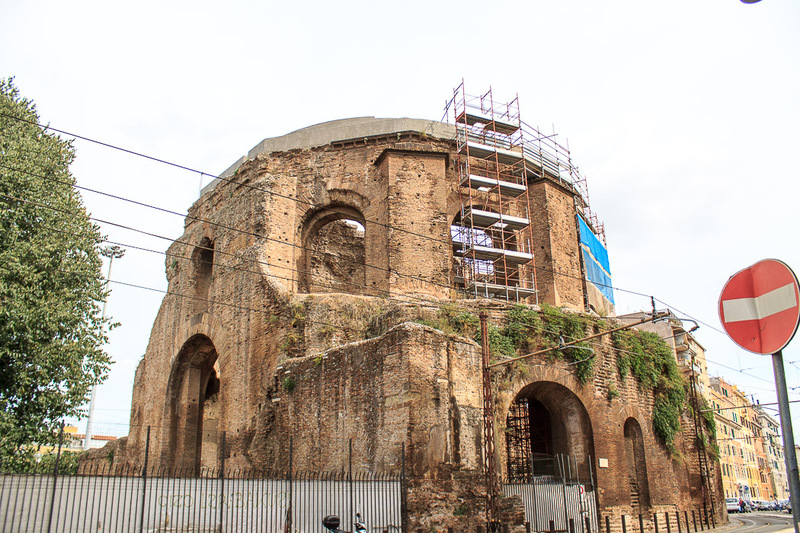 From the metro station you can see the Porta San Giovanni. 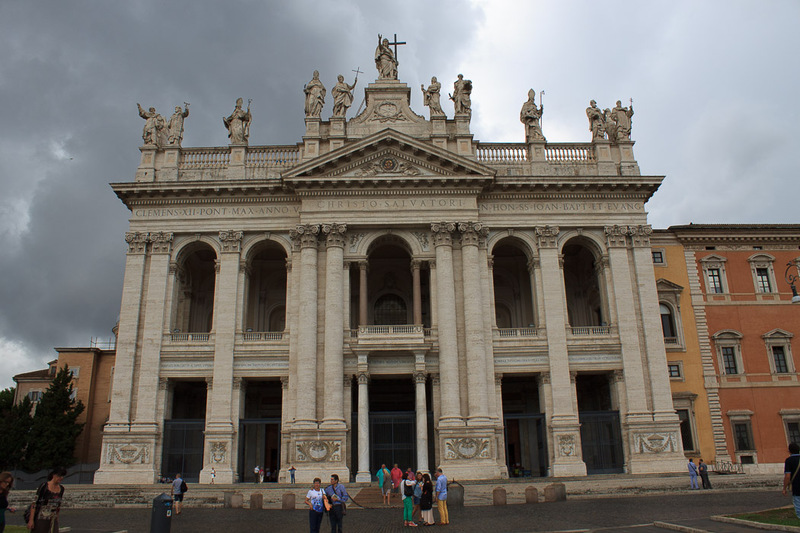 On the other side of Porta San Giovanni from the metro station is the huge church of San Giovanni in Laterano. 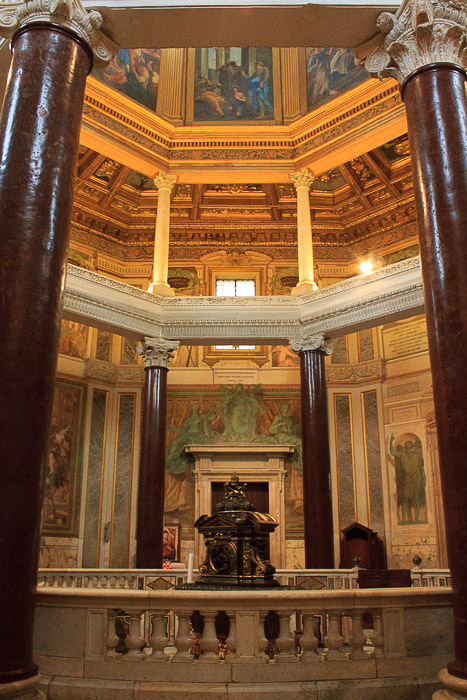 In back of the church of San Giovanni in Laterano is the Piazza di San Giovanni in Laterano, in the center of which is the obelisk. 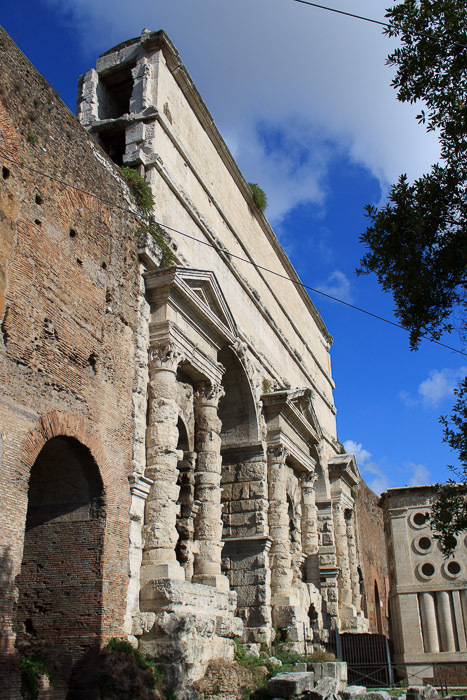 Walk out to the main street, Via Emanuele Filberto, in front of the church. 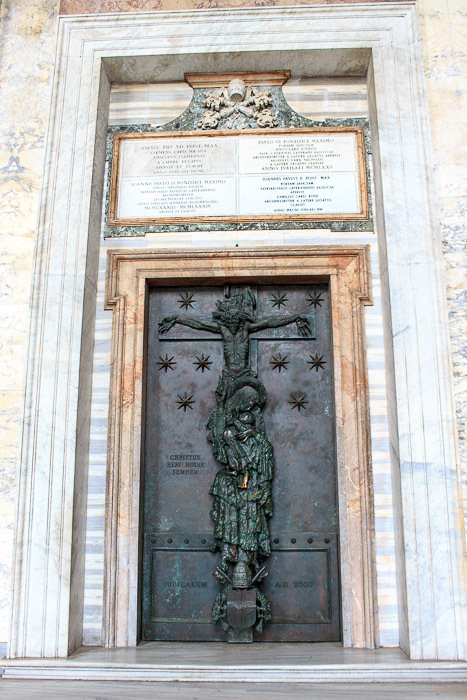 Cross the street, turn left and walk one block past the church to Via Statilia, turning right onto that street. 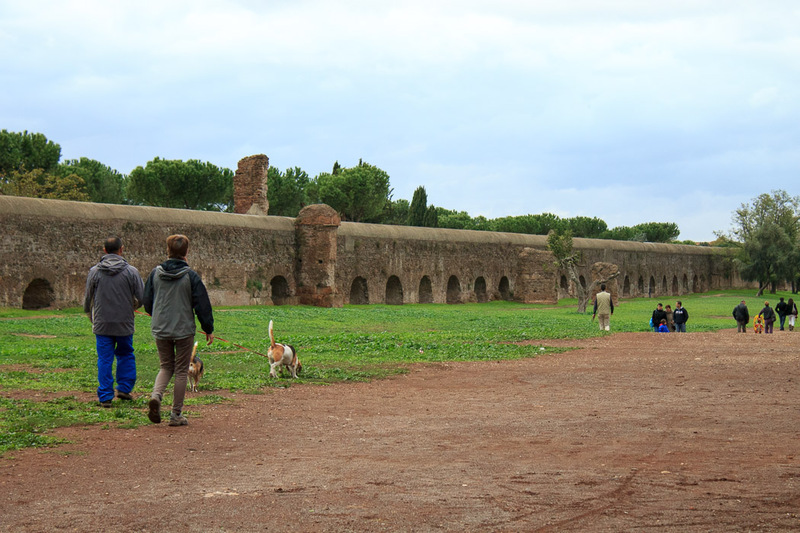 Walk a couple blocks to the Freedmen's Tombs on the right. 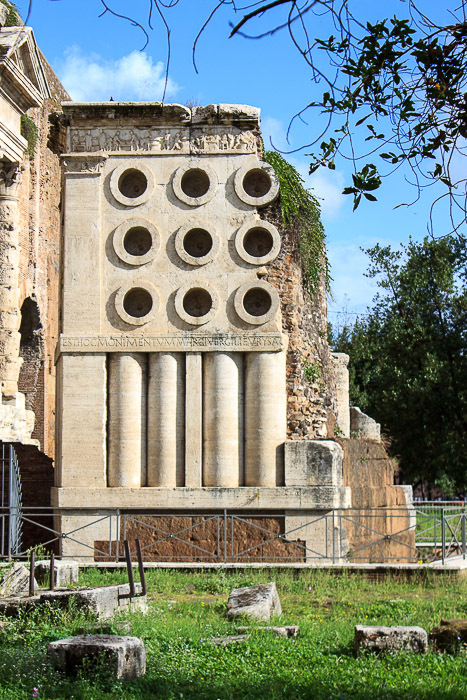 These tombs were built during the Republican age at about 100 BC. 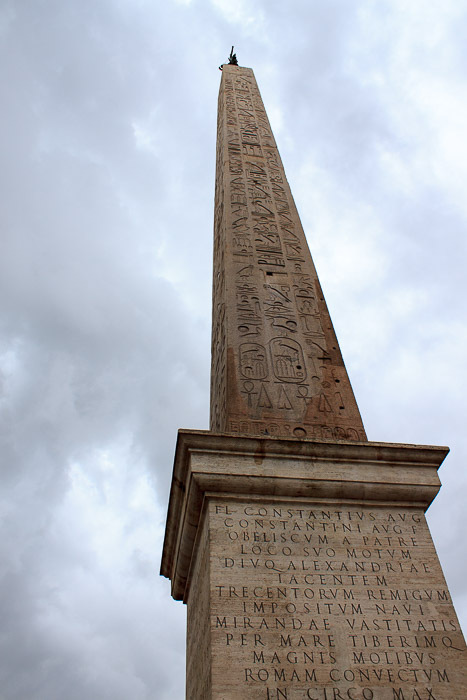 They were created by and for slaves who had been freed by their masters and then earned their own livings. 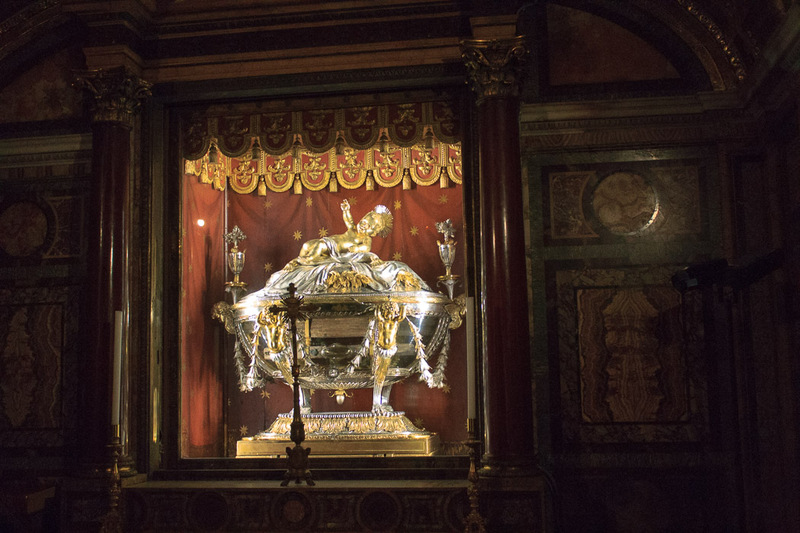 Their pride in this accomplishment led them to create these lavish funerary monuments. 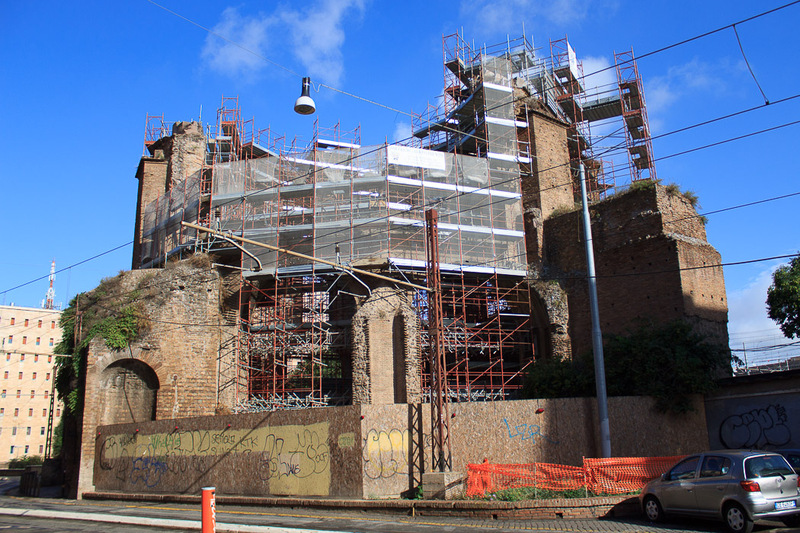 The tombs were found during construction works on Via Statilia in 1916, and the shelter now above them was built to protect them from the elements. 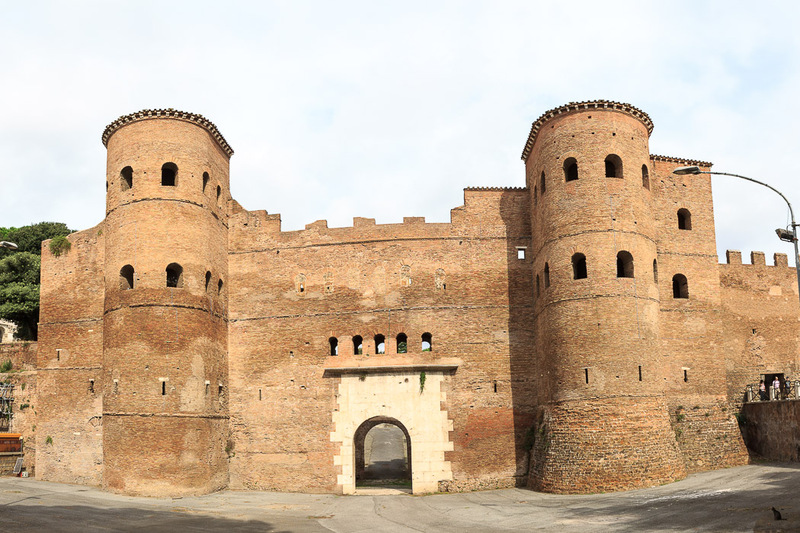 A fence prevents close approach but they are easy to see from behind it. 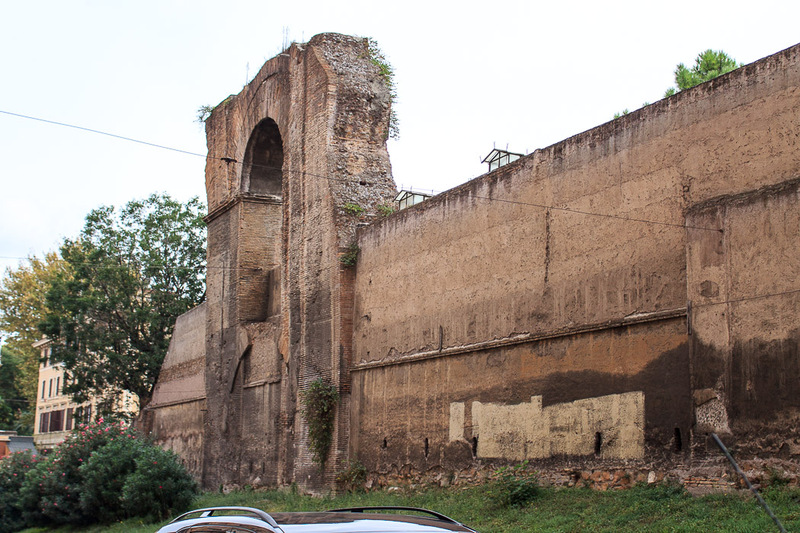 Nearby the Aqua Claudia runs parallel with Via Statilia from Porta Maggiore to just past the tombs. 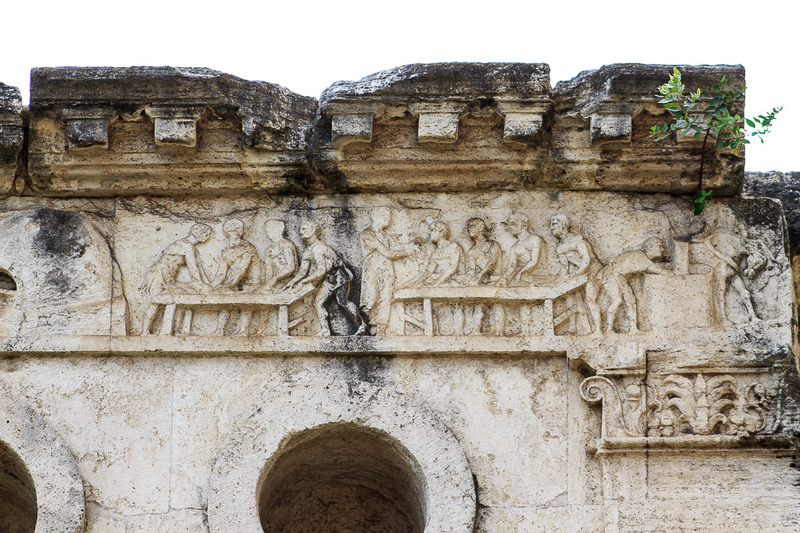 In front of Porta Maggiore is another tomb built by a freedman, the Tomb of Eurysaces the Baker. 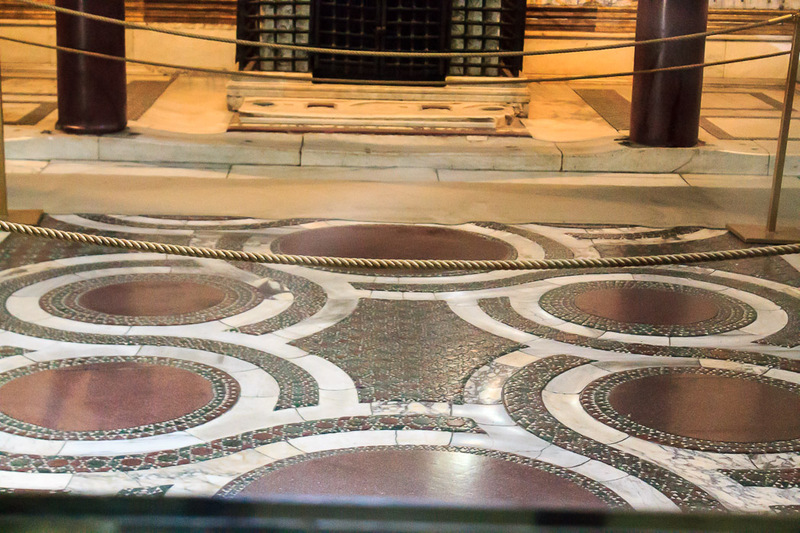 See all Freedmen's Tombs photos. 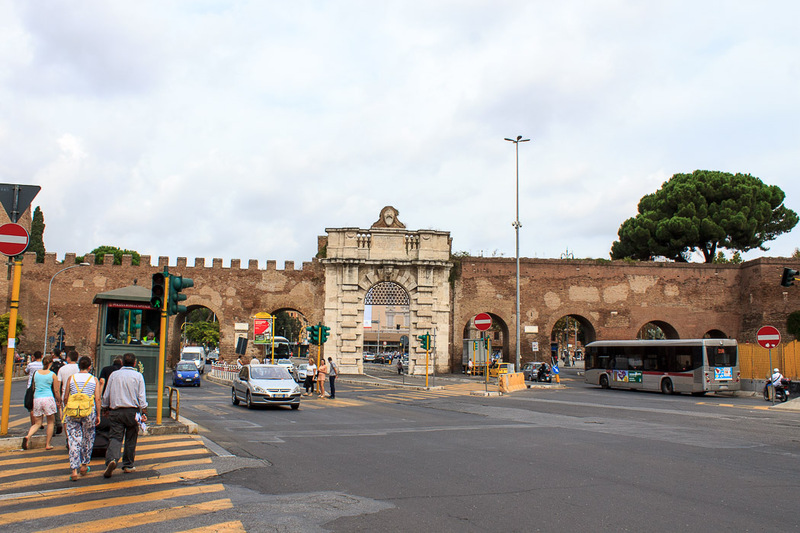 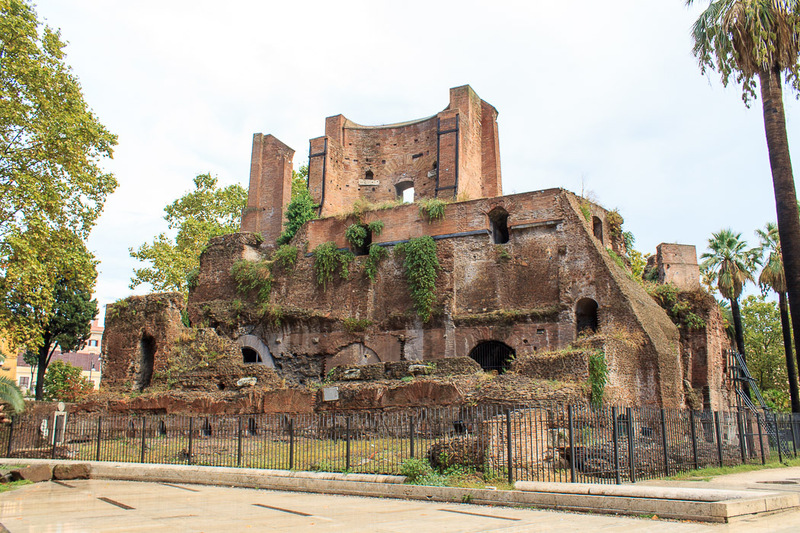 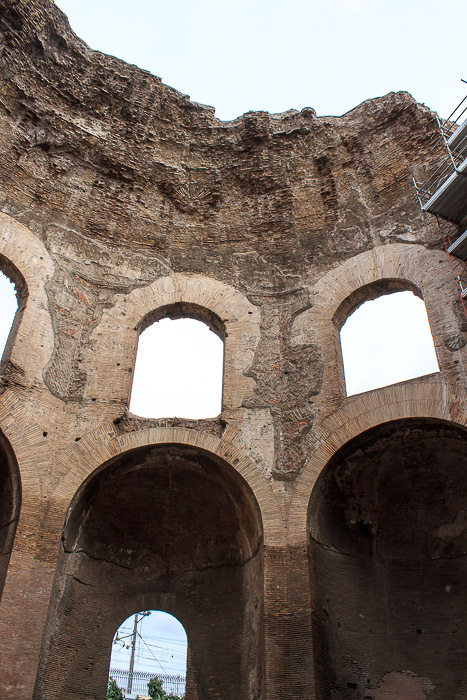 Continue walking down Via Statilia in the same direction until you walk into a large oval transportation hub with many aqueduct arches and the Porta Maggiore, similar to the Porta San Giovanni you saw a while ago. 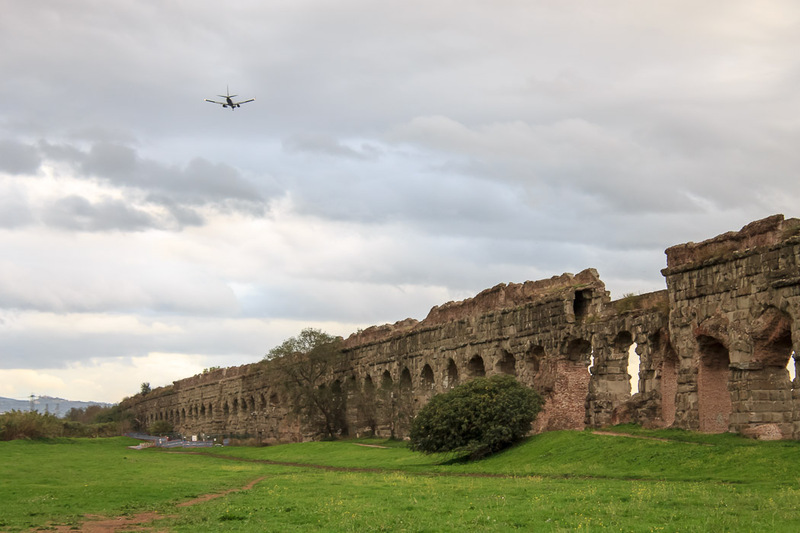 Aqua Claudia was an aqueduct in ancient Rome. 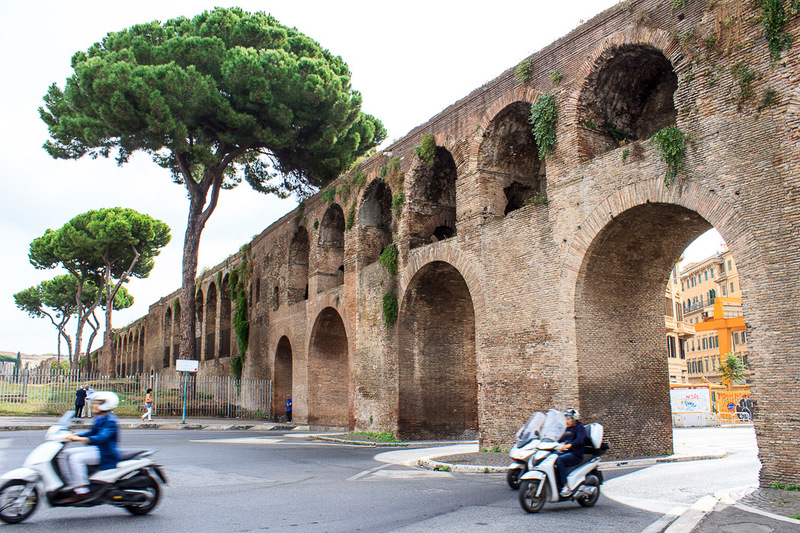 This aqueduct has the best visible remains today. 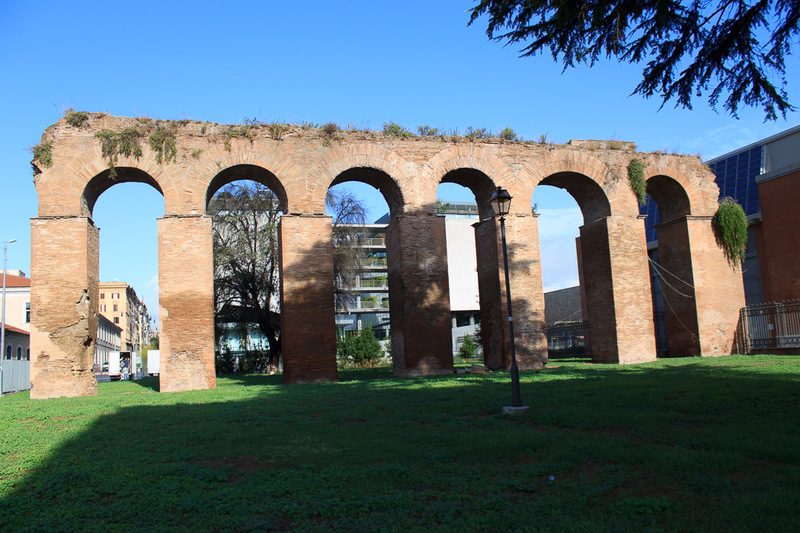 It can be seen at several locations in Rome: perhaps the best are at Aqueduct Park (1st photo below) and at Porta Maggiore (2nd photo below). 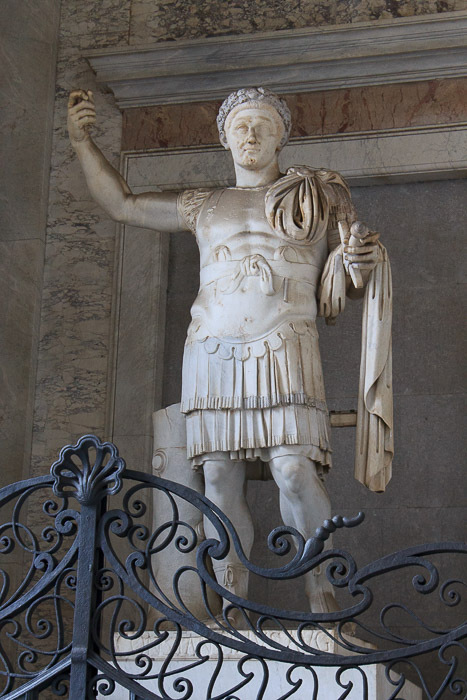 It and the Aqua Anio Novus were begun by emperor Caligula in 38 AD and completed by Claudius who dedicated them on August 1, 52 AD. 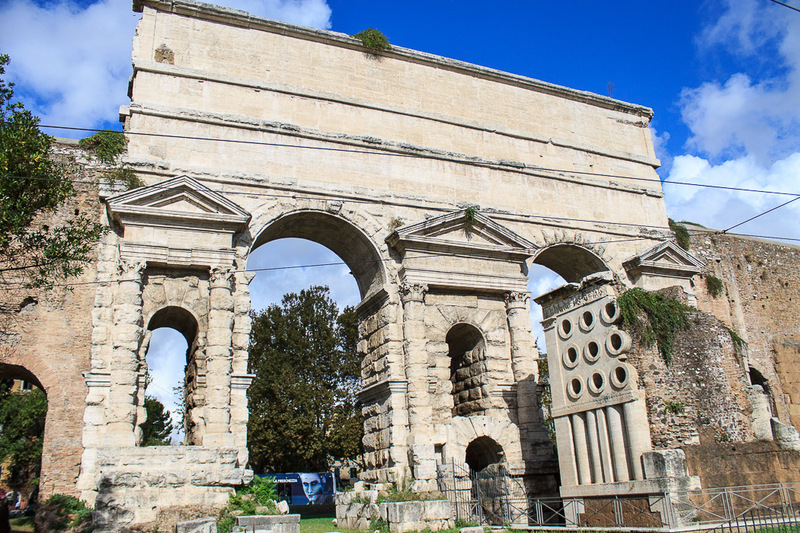 Aqua Claudia was apparently defective, since it required repairs which closed the aqueduct for nine years and were completed by Vespasian in 71 AD. 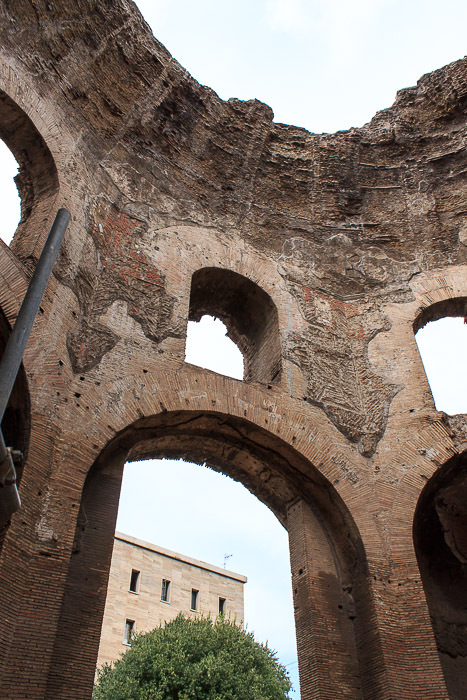 Another set of repairs was performed under Titus in 81 AD. 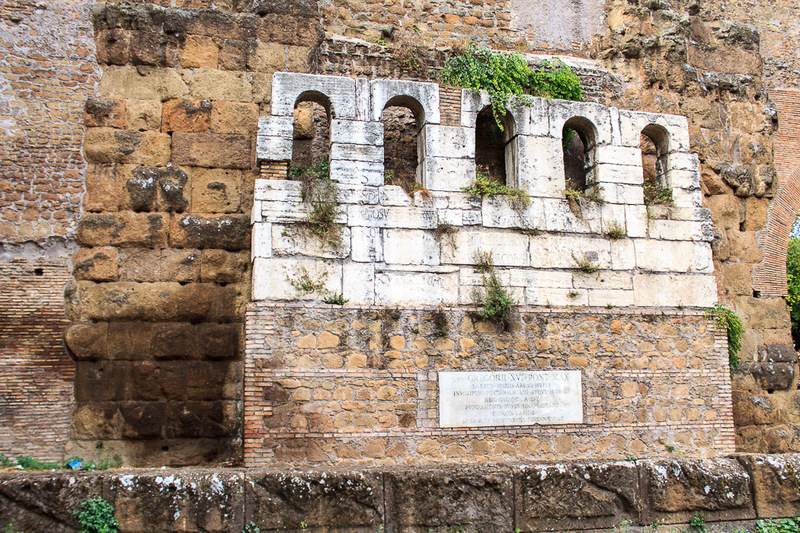 The aqueduct's source was a number of springs in the Anio Valley. 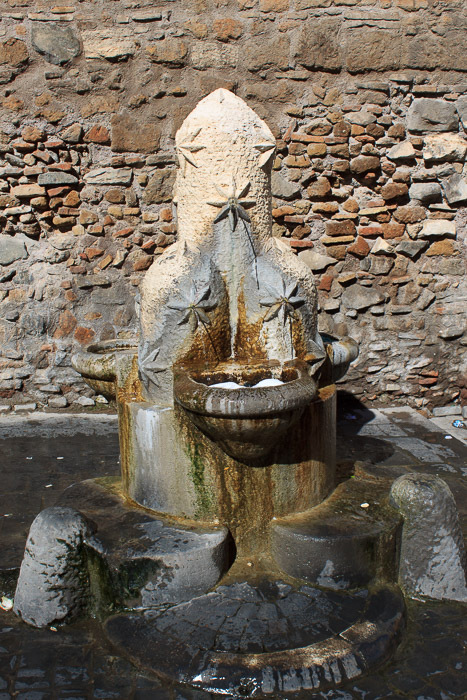 Originally the Caeruleus and Curtius were used, later the Albudinus spring was added. 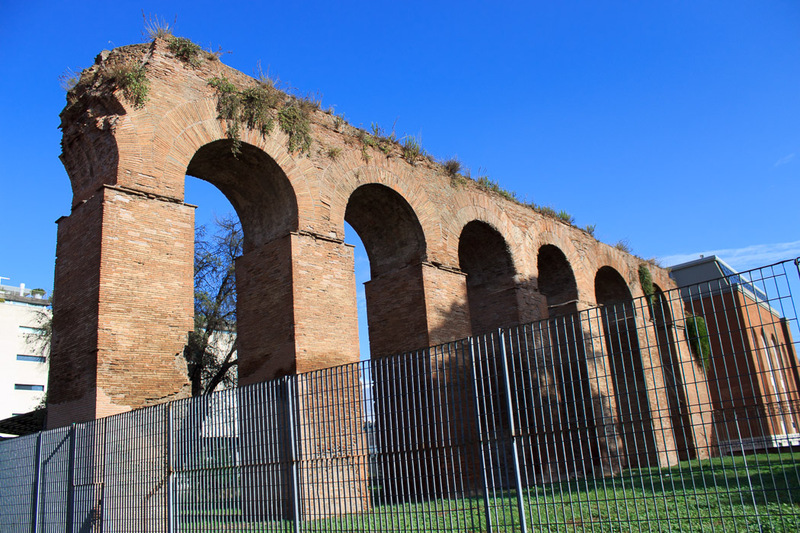 The aqueduct was 45 miles long, most of which was underground until it reached a filtering tank near Capannelle, near the seventh milestone of the Via Latina, not far from Aqueduct Park, where it was then carried into Rome on a channel below that of the Aqua Anio Novus as it crossed land on a long series of high arches as the land's elevation lowered toward Rome. 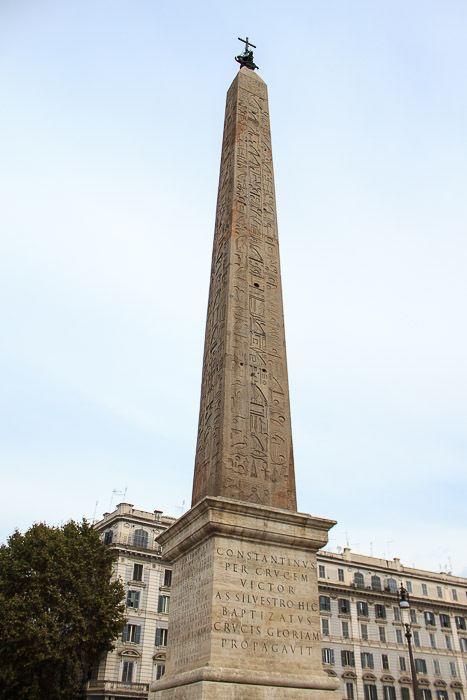 The whole time it dropped one foot closer to the center of the earth per 300 feet of travel, so gravity could pull the water downhill into Rome. 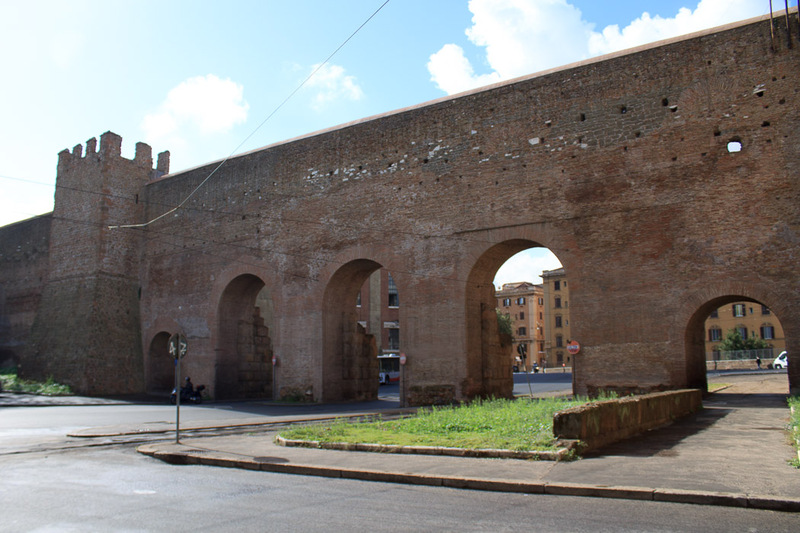 After about 7 miles on arches, the Aqua Claudia entered Rome at Spes Vetus and approached the Porta Maggiore. 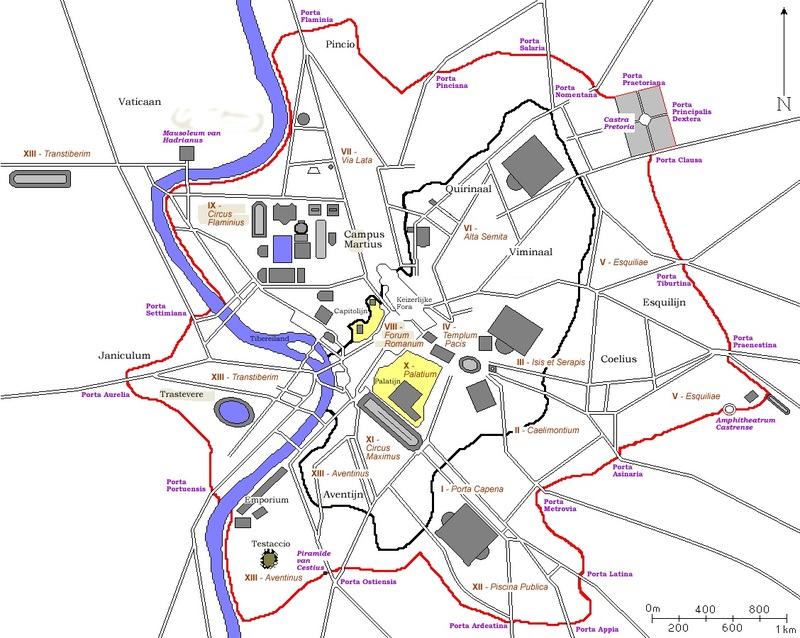 It was split here by Nero with his split heading southwest toward the Palatine Hill and the main flow crossing over Porta Maggiore, then turning gradually left to a no-longer-extant settling tank near the Temple of Minerva Medici from which service was provided to the Caelian Hill, the Palatine Hill, the Aventine Hill and Trastevere. 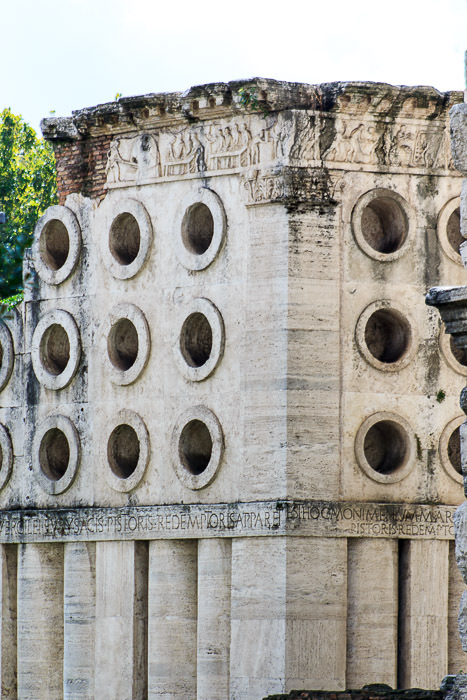 Together, the Aqua Claudia and Aqua Anio Novus nearly doubled the water supply into Rome. 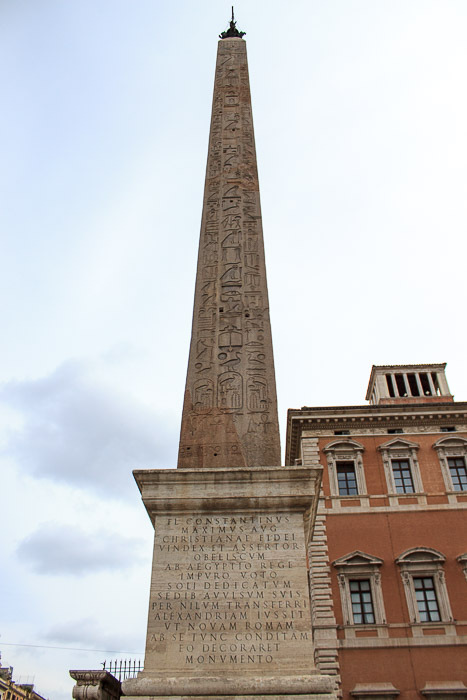 It supplied all fourteen districts of Rome. 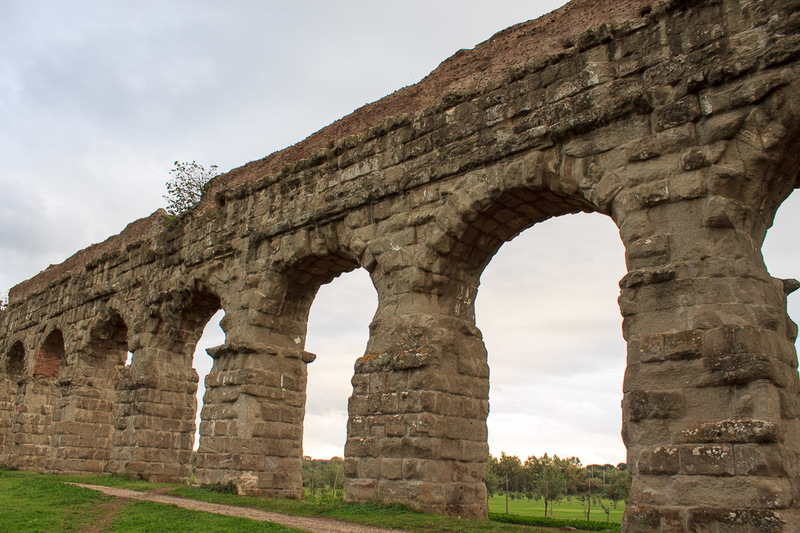 Because of the maintenance required by these two aqueducts, water administrators and maintenance crew doubled in numbers, including crews who patrolled the lines to dismantle the numerous illegal taps. 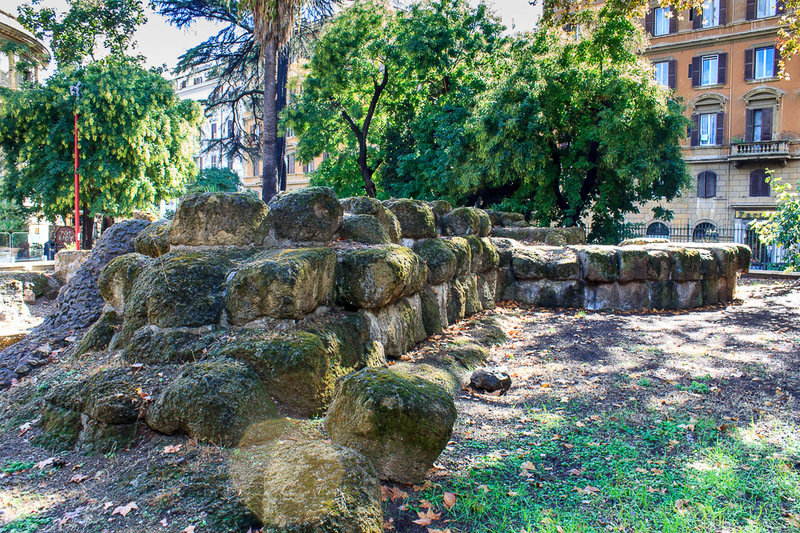 The 3rd and 4th photos below show the remains of the Aqua Nero branch of the Aqua Claudia, found near San Giovanni in Laterano. 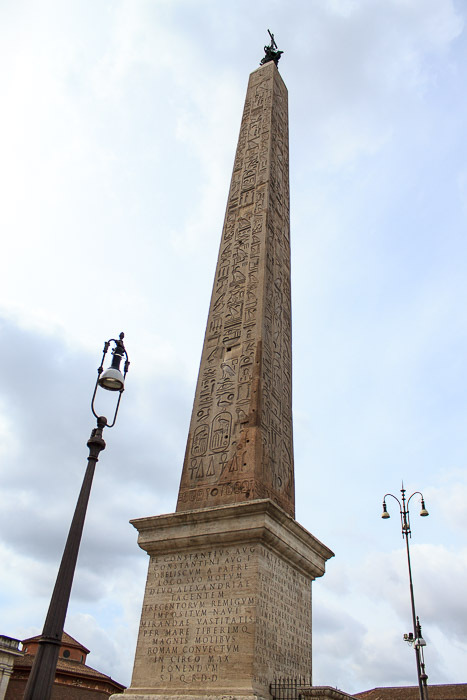 See all Aqua Claudia photos. 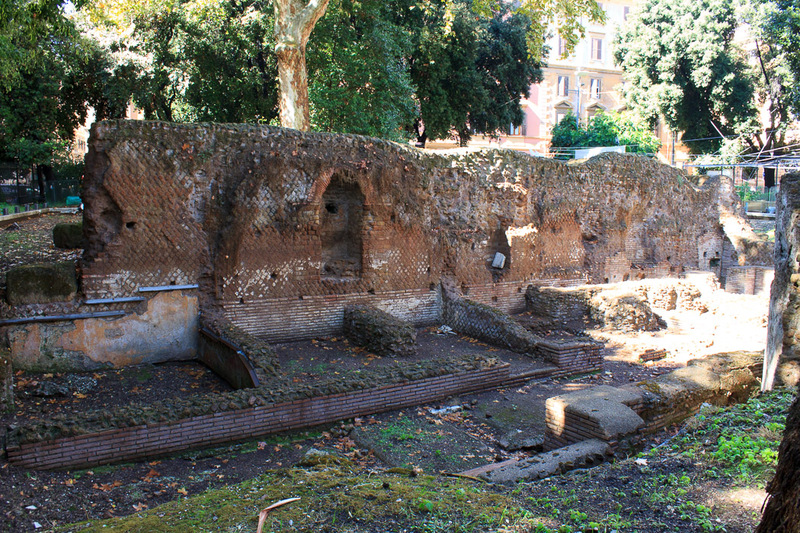 Just outside (east of) the Porta Maggiore is the Tomb of Eurysaces the Baker. 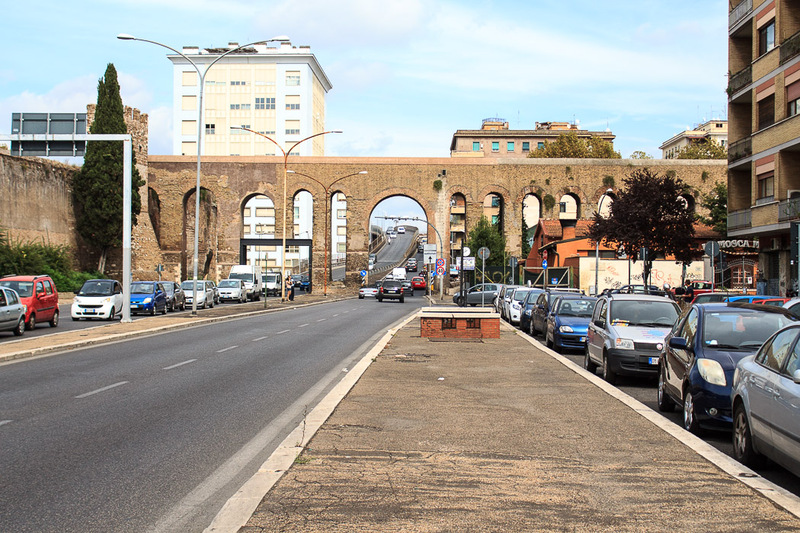 Walk along the street that most closely follows the aqueduct, parallel to the railroad tracks, Via Giovanni Giolatti. 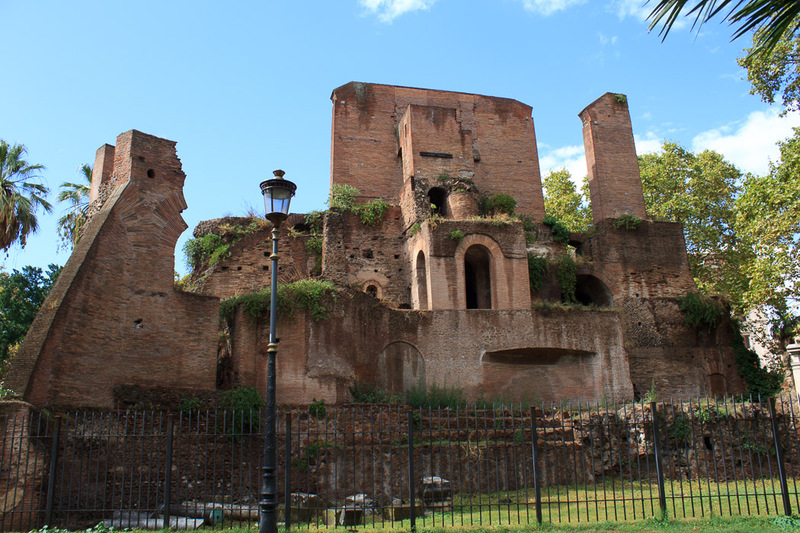 Two blocks down on the right side is the Temple of Minerva Medica. 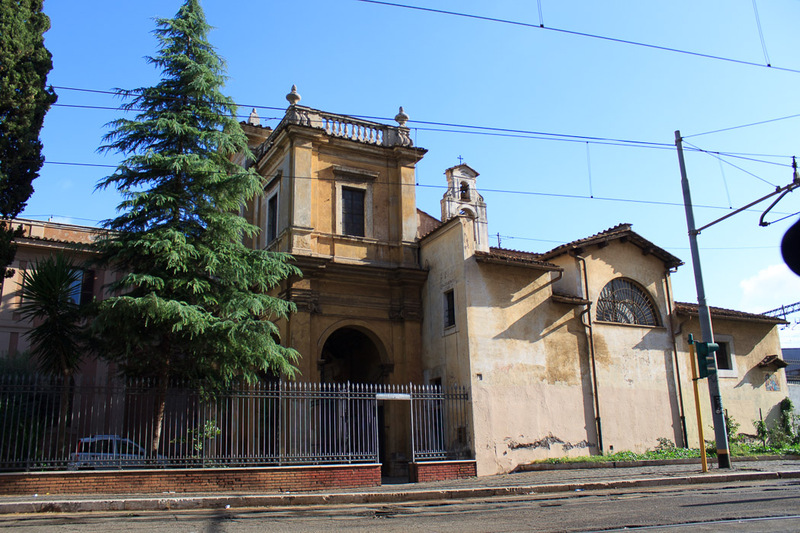 Continue walking down Via Giovanni Giolatti in the same direction for 3 more blocks to the church of Santa Bibiana, also on the right. 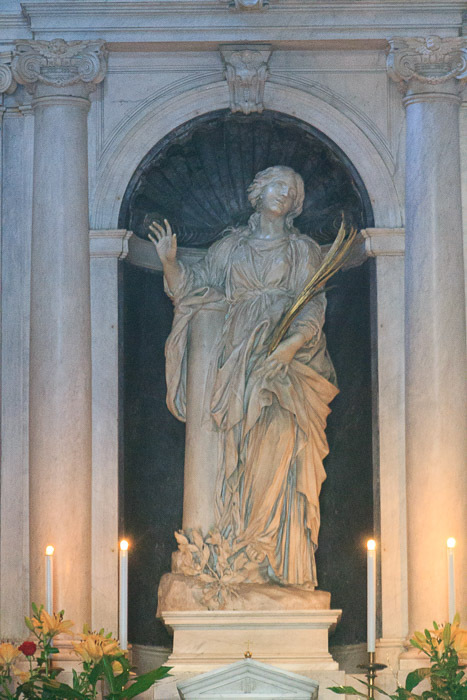 If the church is closed, you can still see the main attraction, the Bernini sculpture of Saint Bibiana, through the glass doors. 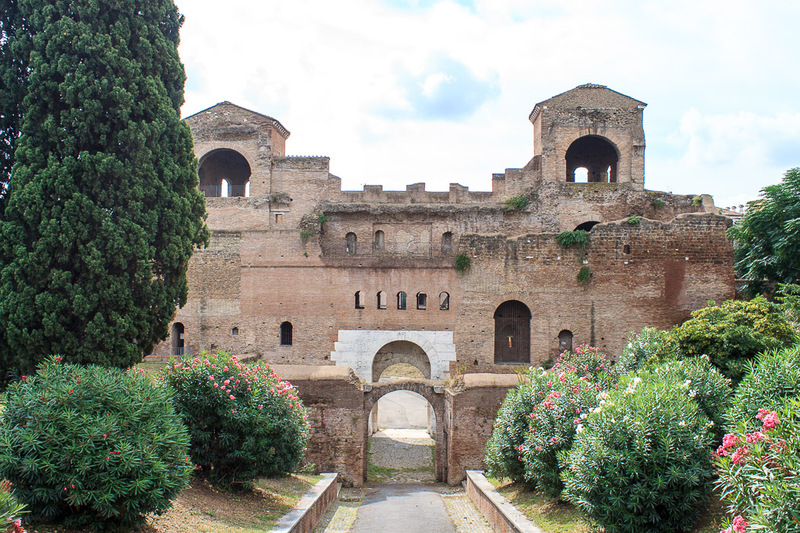 Walk across Via Giovanni Giolatti when you exit the church onto the street Via Cairoli which heads away from the railroad tracks. 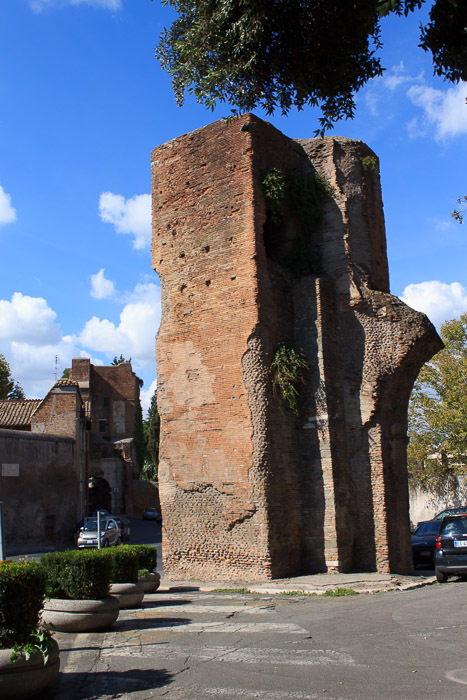 Turn right onto the first street that crosses it, Via Turati, and walk one and a half blocks to the aqueduct on the right. 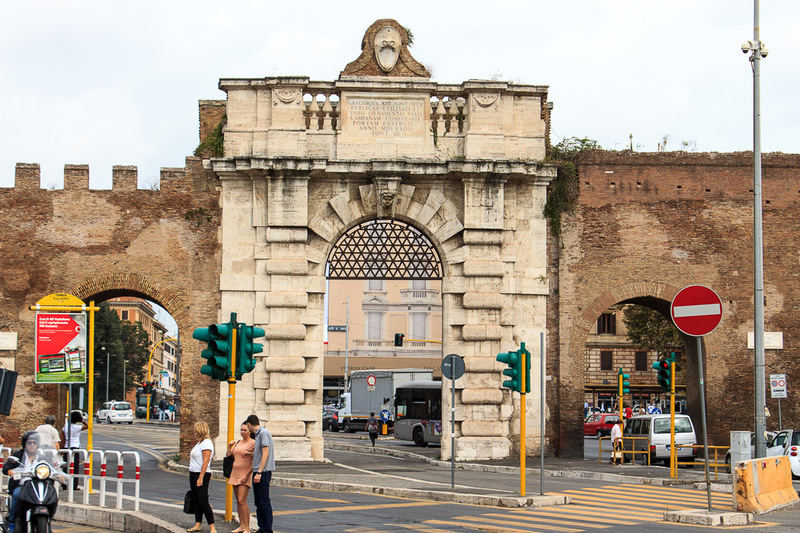 Continue walking on Via Turati for 5 very short blocks to Piazza Manfredo Fanti on the left. 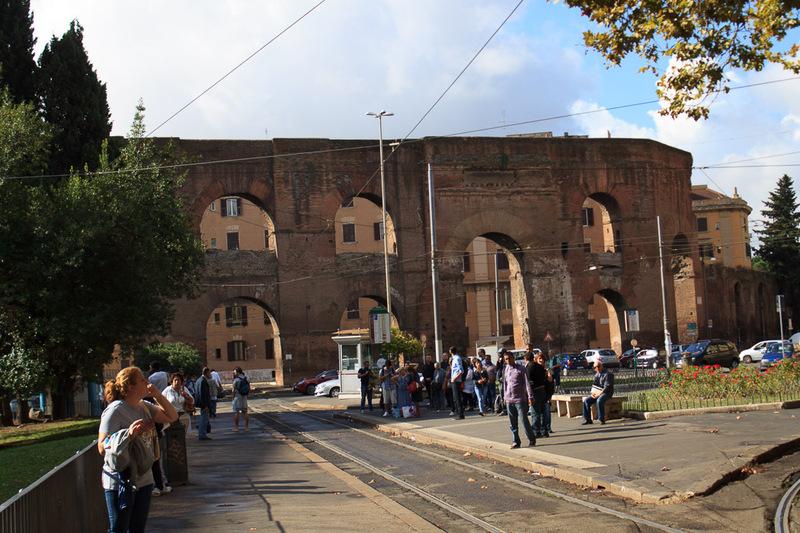 The last street you will have crossed before arriving at the park is Via Rattazzi. 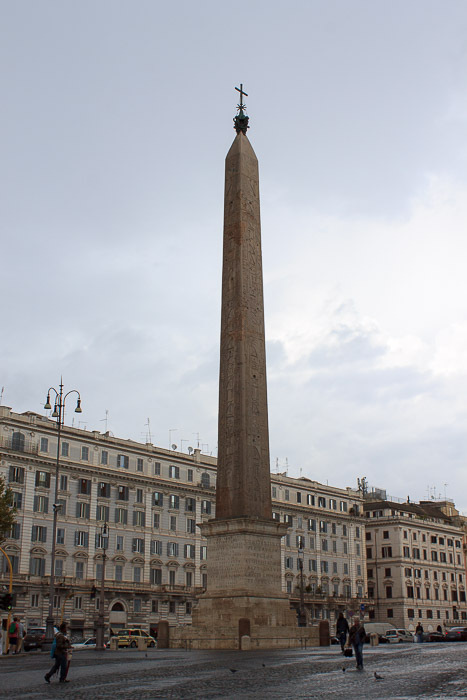 Walk on Via Rattazzi, away from the railroad tracks for 2 blocks to the major street Via Carlo Alberto. 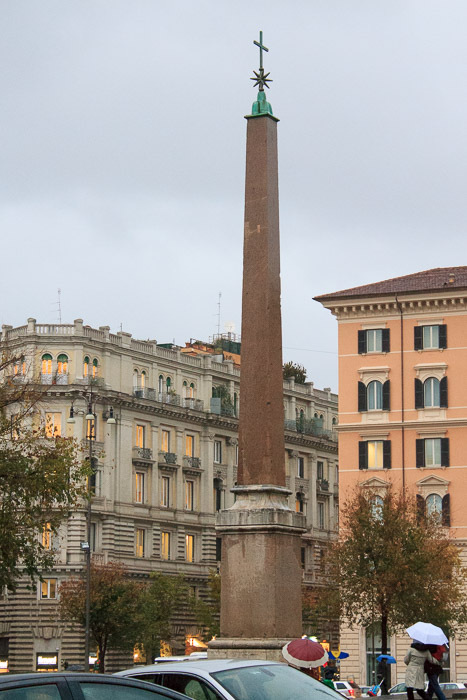 Turn left on that street and walk one short block into the park named Piazza Vittorio Emanuele. 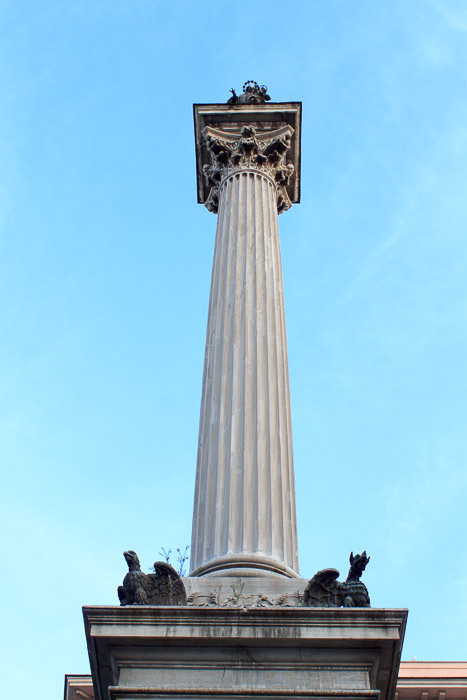 The Trophies of Marius are near the west end, the end of the park you entered. 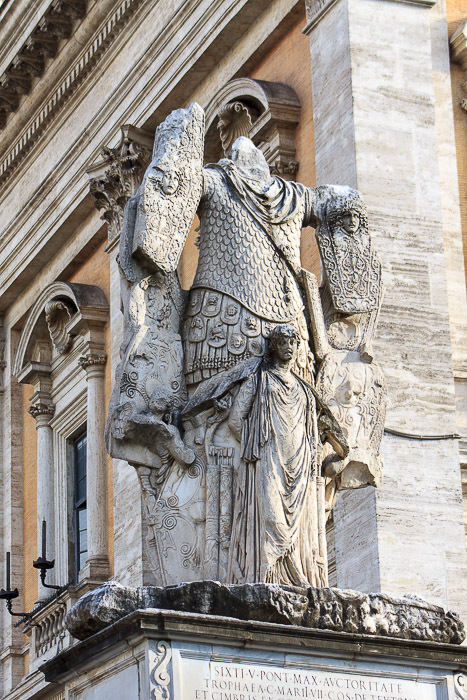 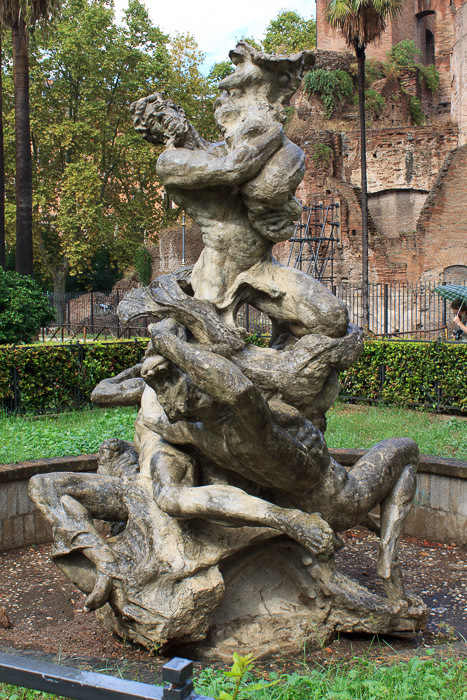 Right next to the Trophies of Marius is the statue which was designed to be in the center of the Fountain of the Naiads but was rejected. 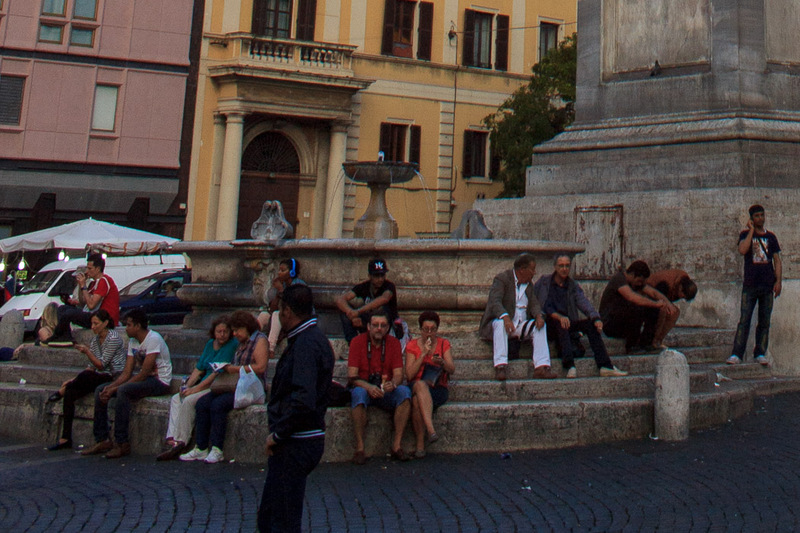 Leave the piazza on the same street you came in by, Via Carlo Alberto. 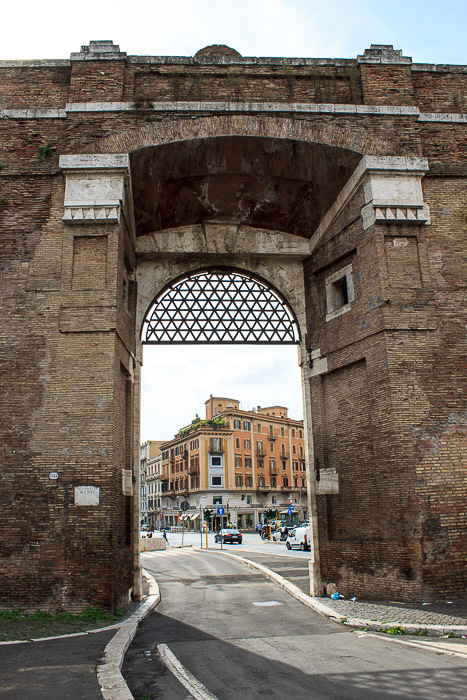 Turn left at the first street, Via San Vito. 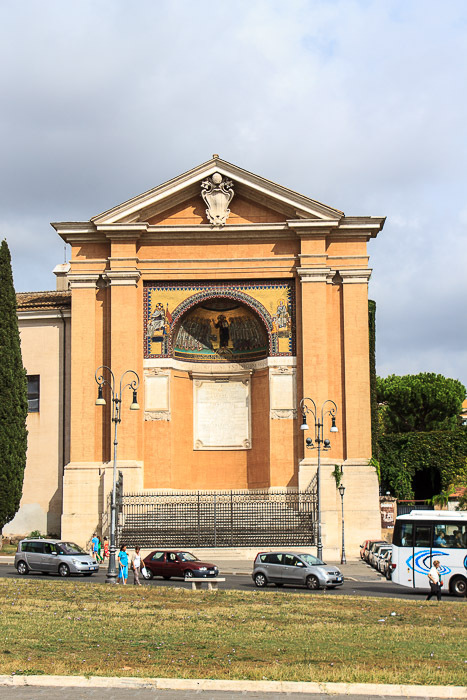 Crossing over the street next to a church is the Arch of Gallienus. 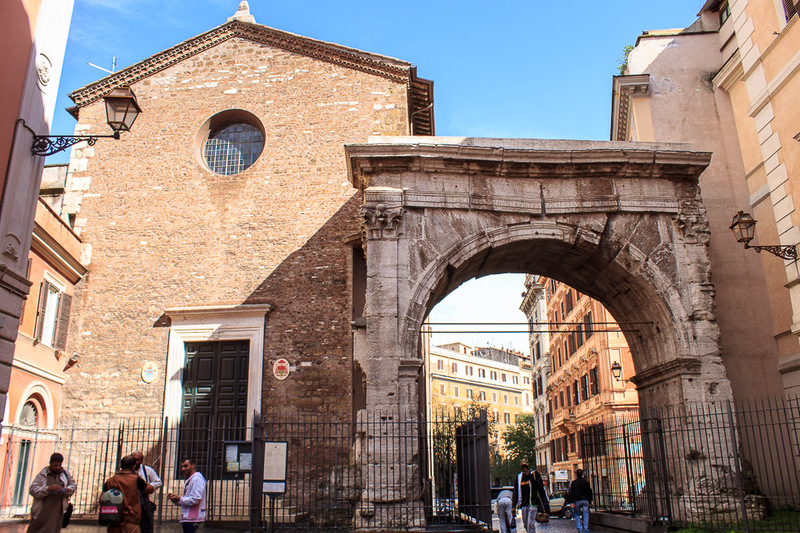 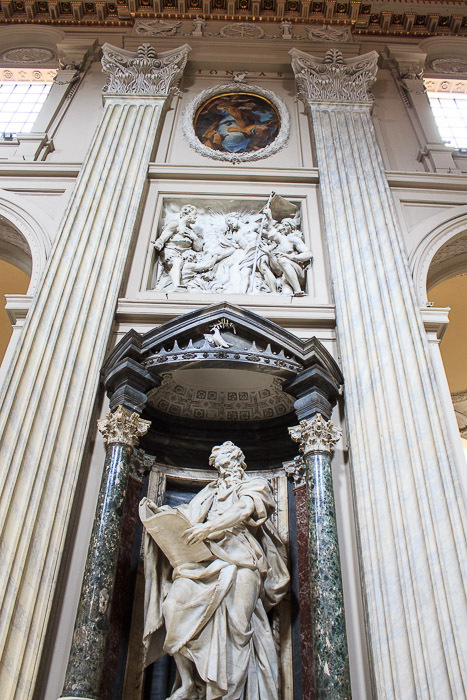 The Arch of Gallienus, also known as the Arch of St. Vitus after the church the arch is located against, is located on the tiny road Via di San Vito, which is one block southeast from the church of Santa Maria Maggiore. 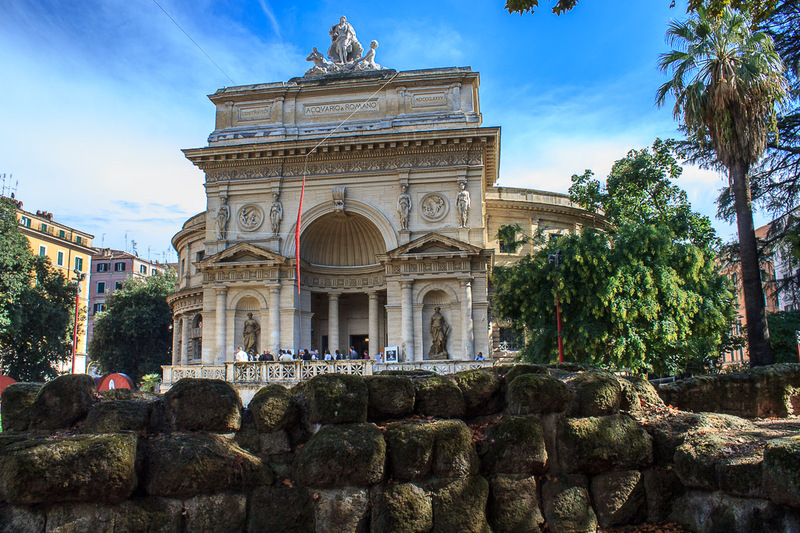 The nearest metro stop is Vittorio Emanuele. 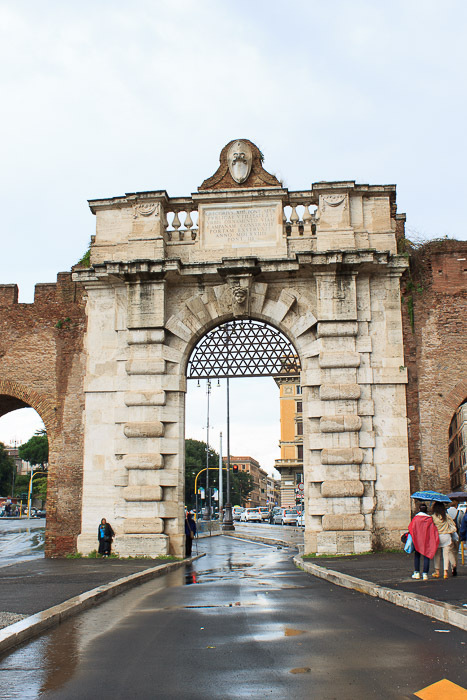 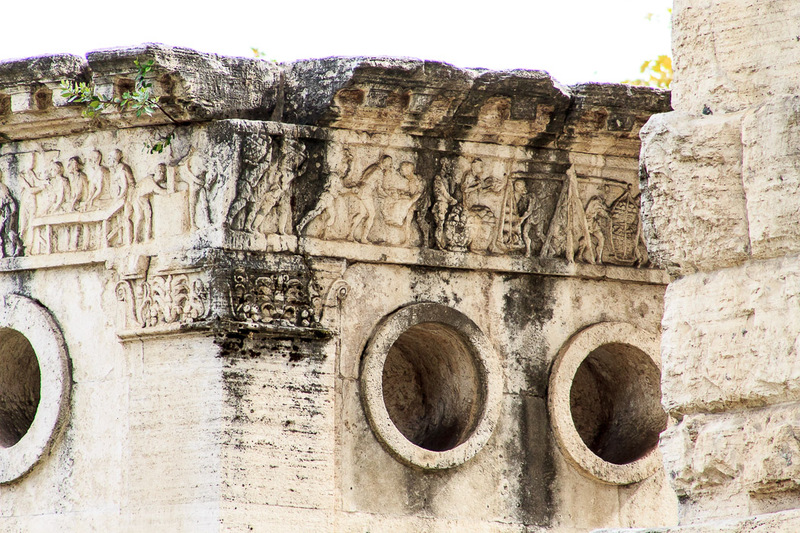 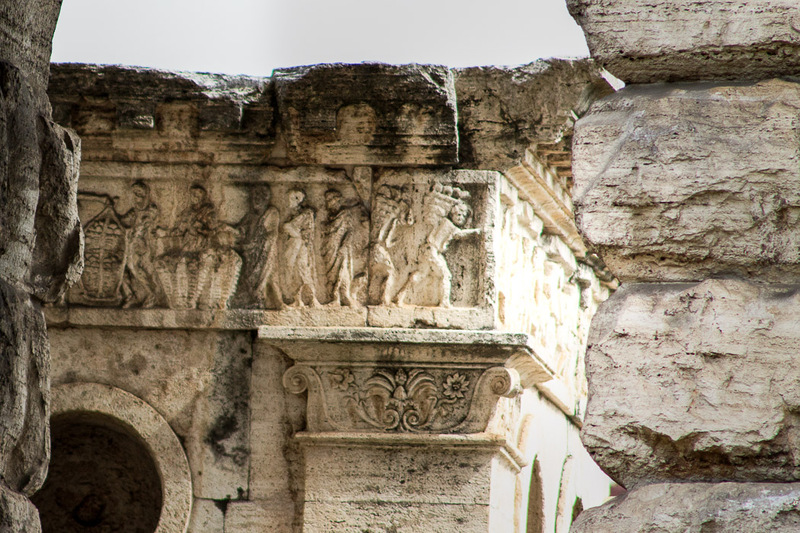 Its original name was the Porta Esquilina, an ancient Roman arch in the Servian Wall. 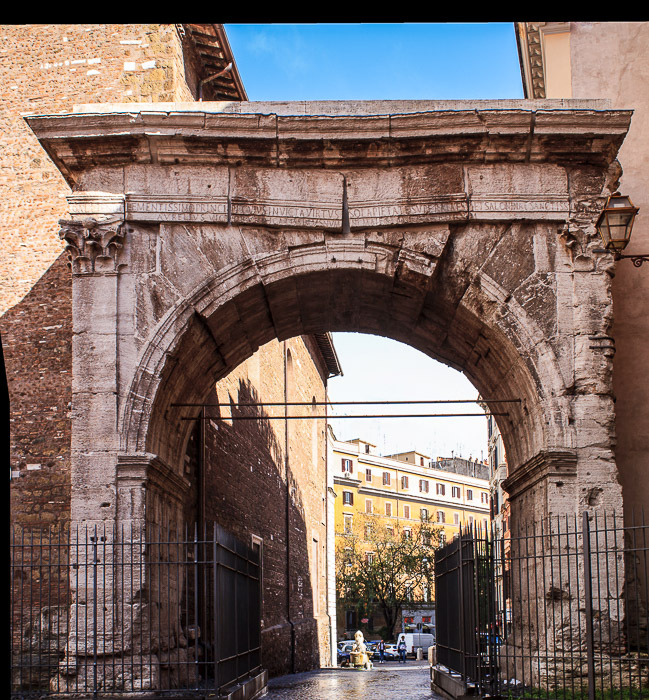 During the time of Augustus, two minor arches were added at the sides of the major one, giving the arch a monumental appearance. 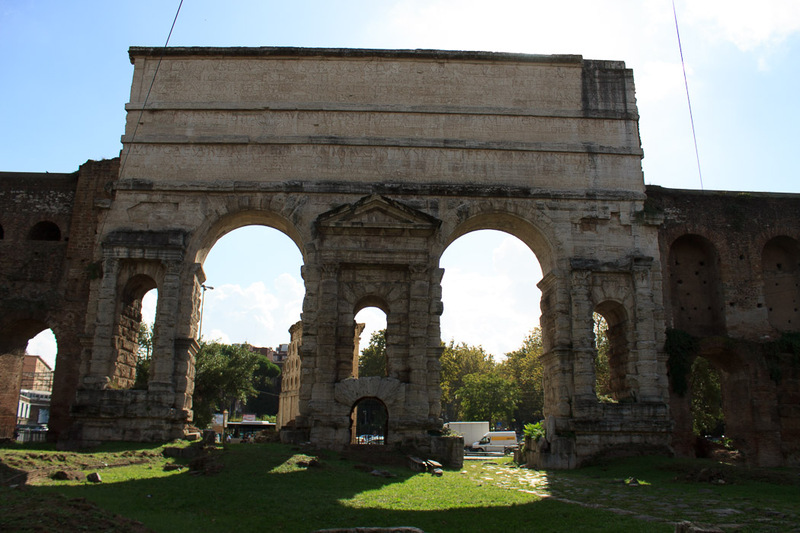 In 262, Aurelius Victor rededicated the arch to Gallienus (Emperor from 253 - 268 AD) and his wife Cornelia Salonina. 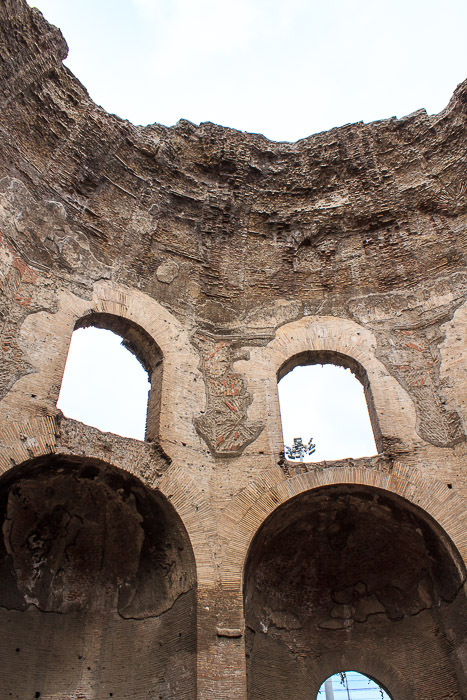 The surviving single arch (1st and 2nd photos below) is made of white travertine, and is 29 feet tall, 24 feet wide, and 11 feet deep. 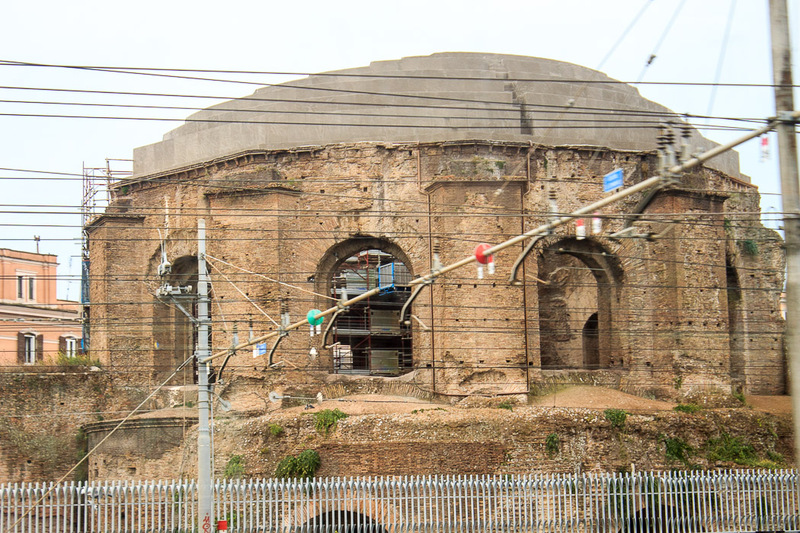 The arch looks like it's about to fall down (especially evident in 3rd photo below); I hope it's been stabilized properly. 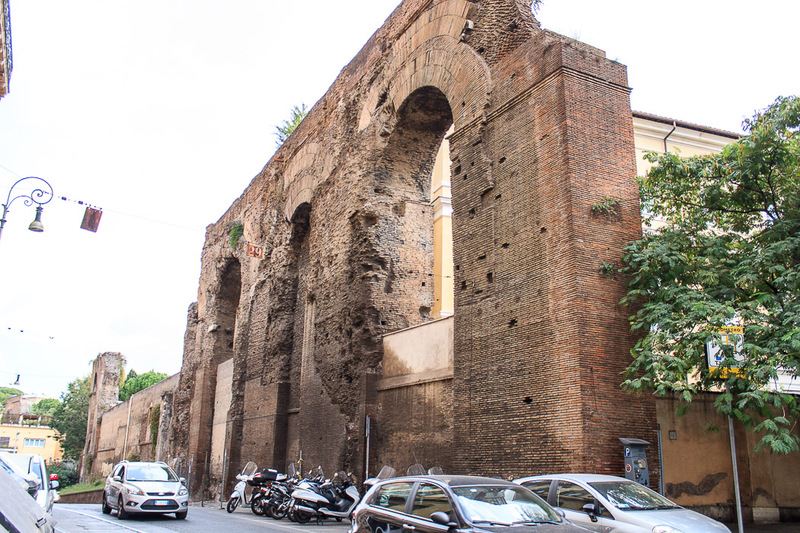 The side arches still existed in the 15th century, but they were demolished when the church was built and no trace of them remains today. 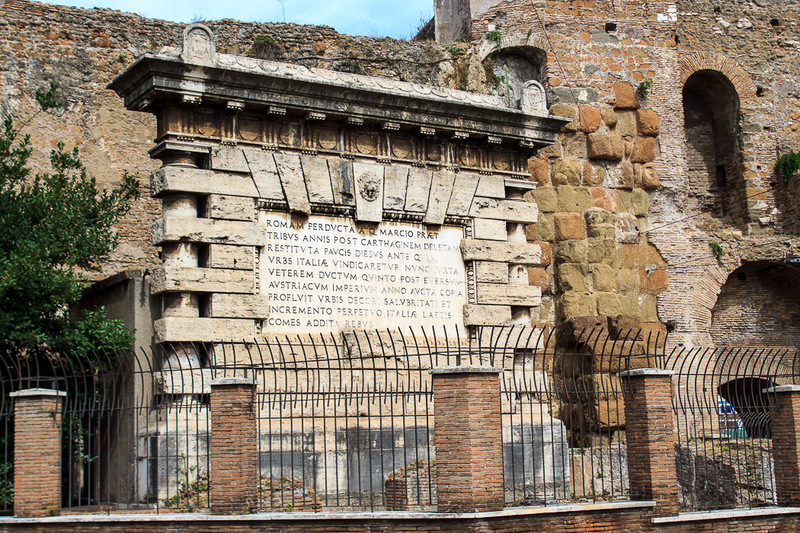 The inscription (photo below) "To Gallienus, the most clement princeps, whose unconquered virtus is only outdone by his pietas, and to Salonina, most holy Augusta, Aurelius Victor, the excellent man, [dedicated this] in complete devotion to their numines and majesties" was actually just the end of the original inscription. 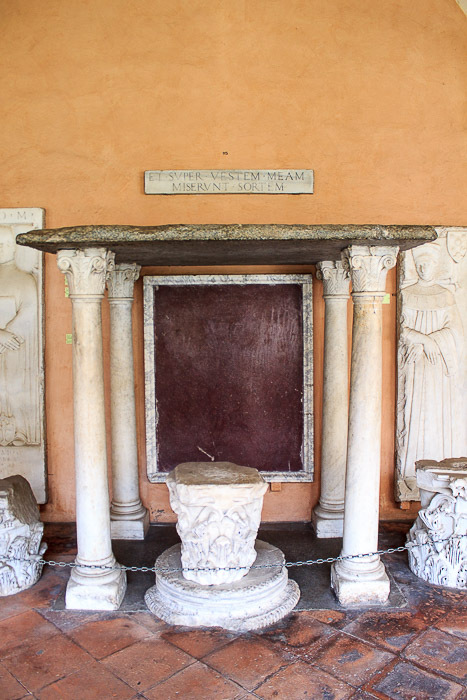 The large blank space above them had marble slabs with the beginning of the inscription. 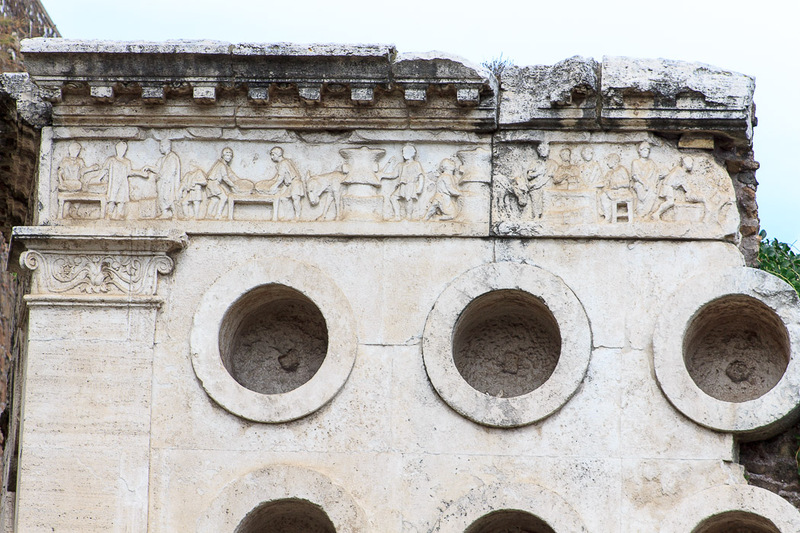 The holes for the metal pegs that mounted those marble slabs are still visible. 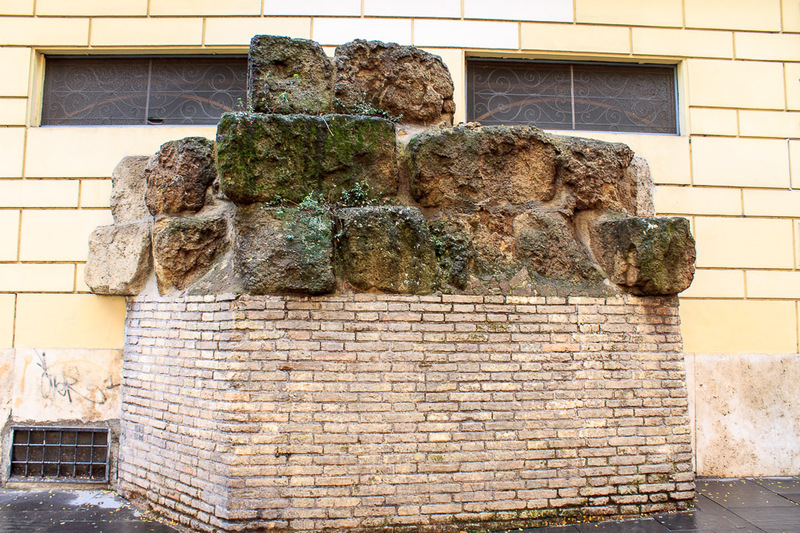 On the other side of the church, on Via Carlo Alberto, a very small fragment of the Servian Wall remains (photo below), jutting out from a yellow building onto the sidewalk, with bricks supporting the remains. 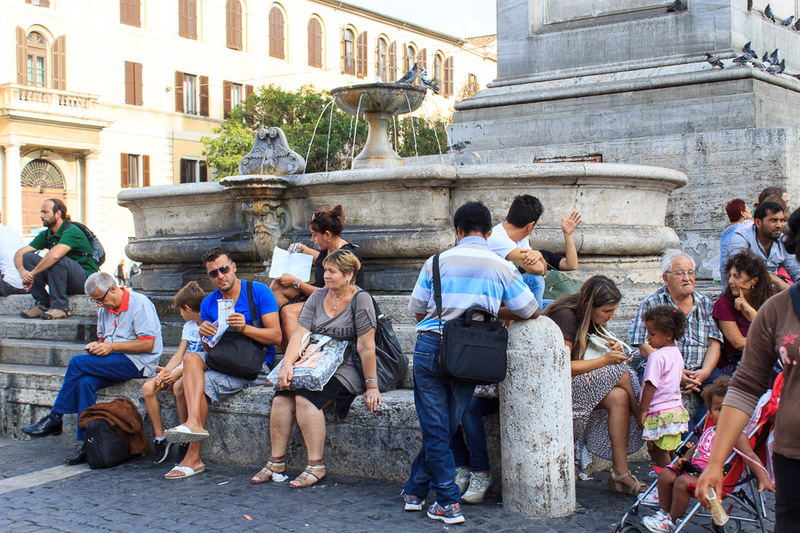 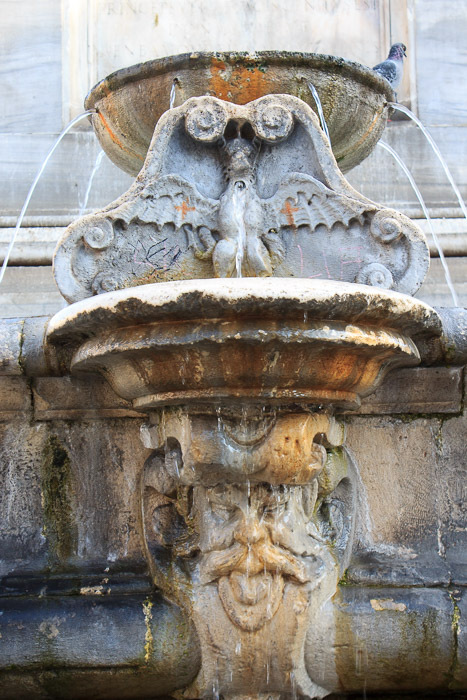 On the same street is the Fontana dei Monti. 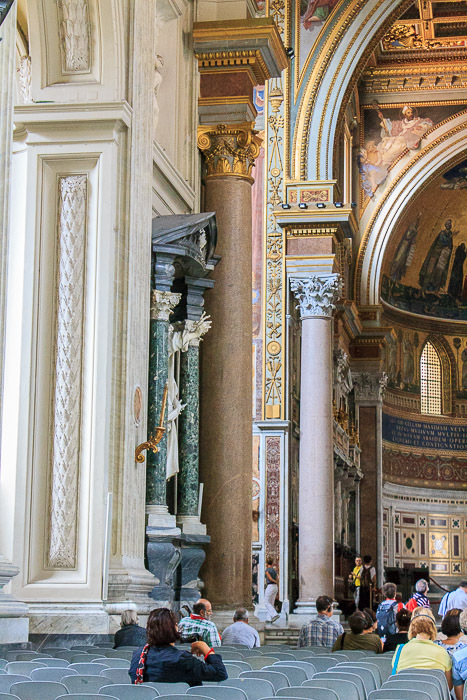 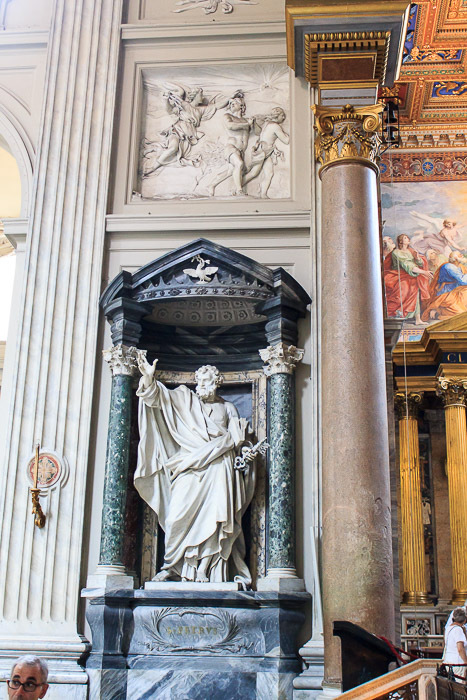 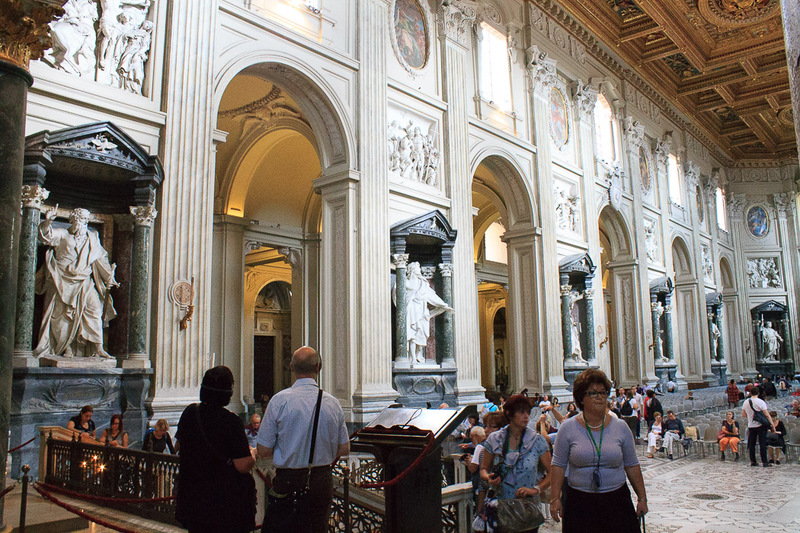 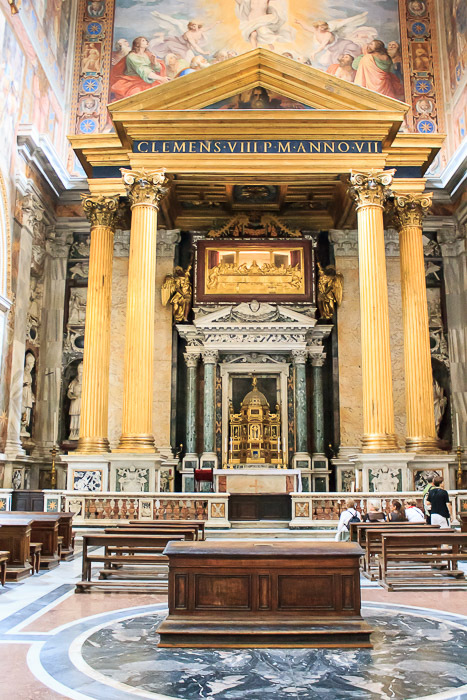 Walk out the opposite end of Via San Vito as that you came in at, turn right on the busy Via Merulana to head toward the tall column in front of Santa Maria Maggiore, but turn left into the tiny alley before you reach the piazza. 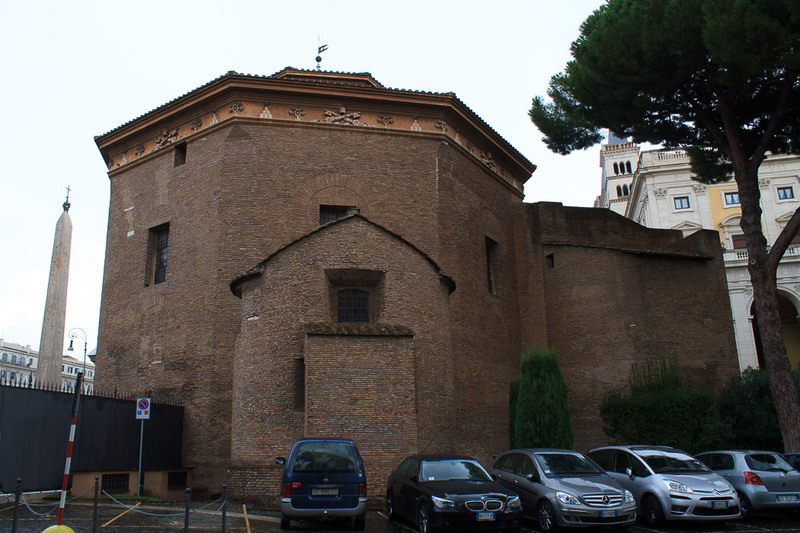 At the end of the alley is the church of Santa Prassede. 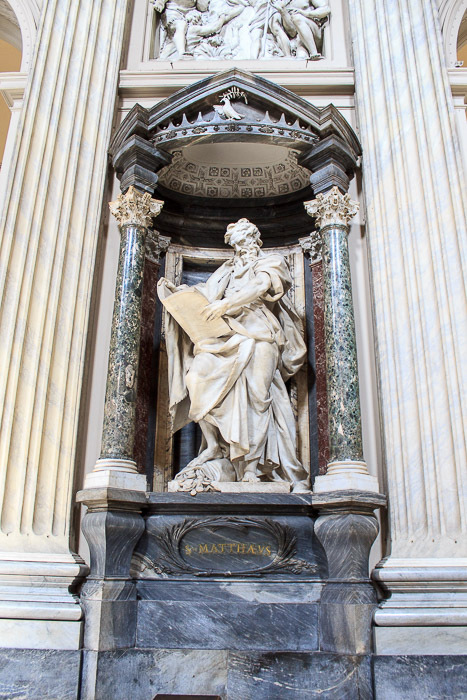 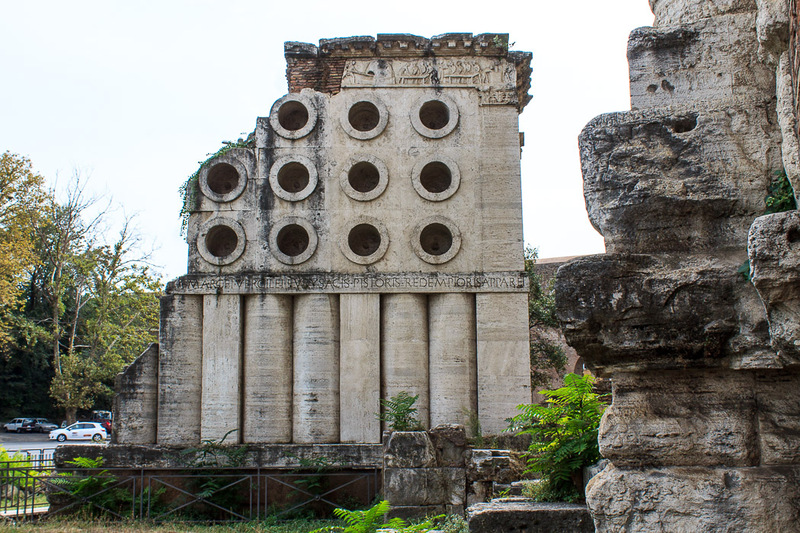 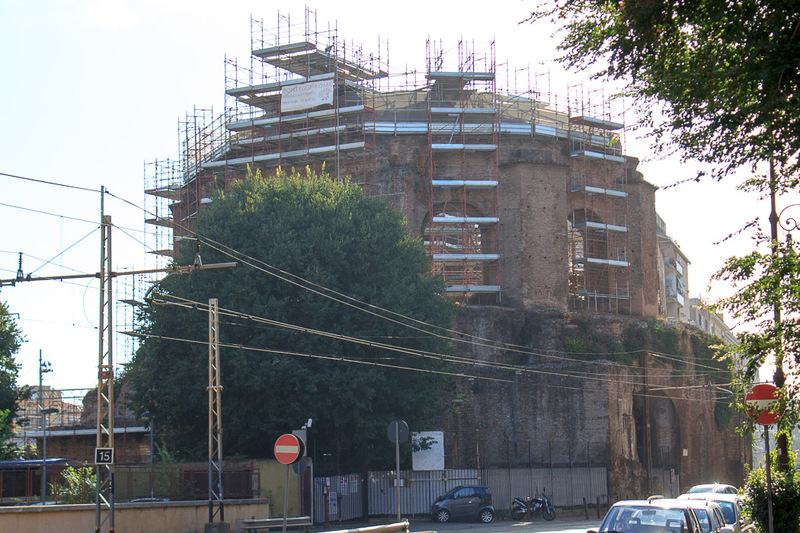 The church of Santa Prassede in its current form was commissioned by Pope Hadrian I around the year 780 AD, built on top of the remains of a 5th century structure designed to house the bones of Saint Praxedes. 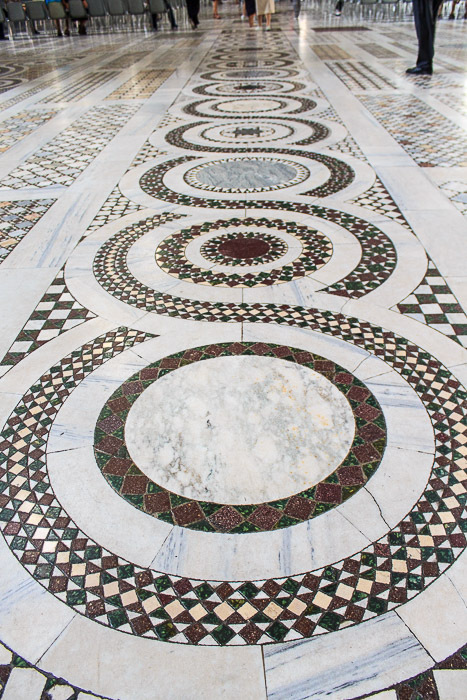 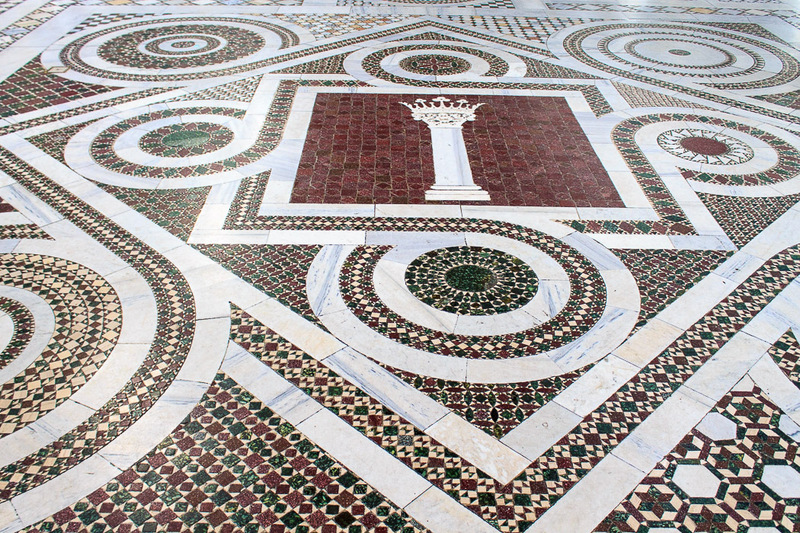 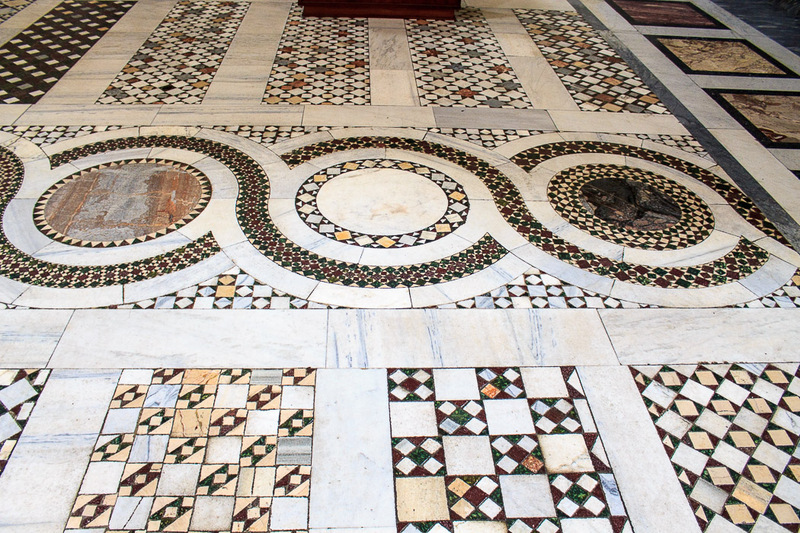 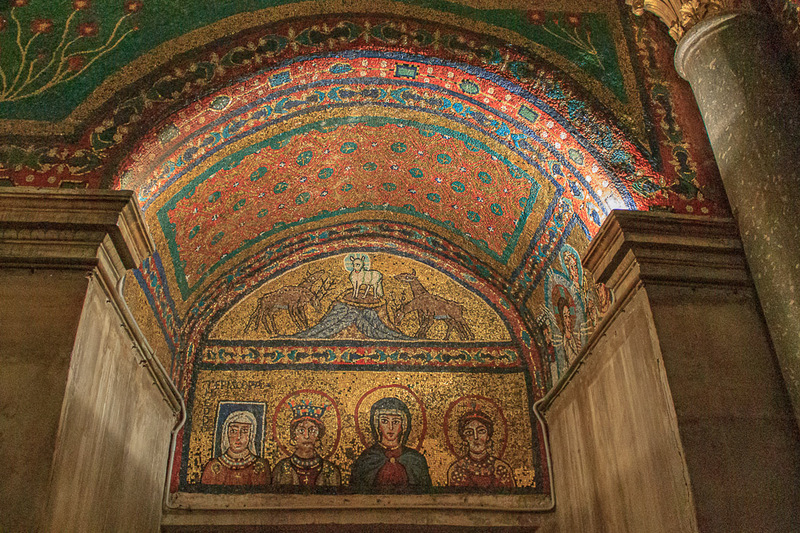 Today the church is most famous for its impressive mosaics throughout the church. 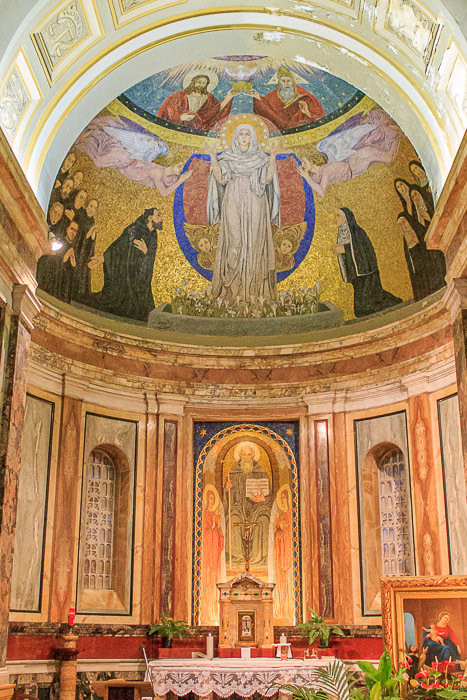 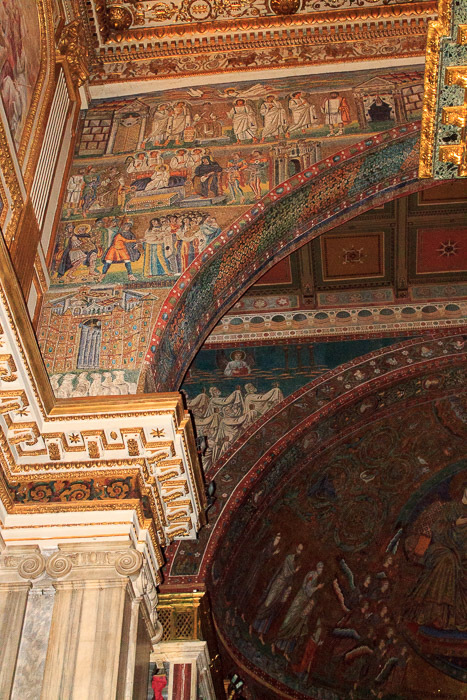 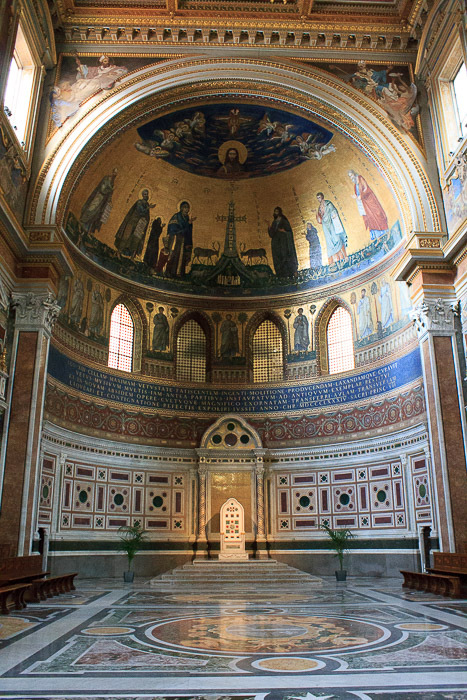 The apse mosaic (1st photo below) features Jesus in the center, with Saints Peter and Paul on his left and right. 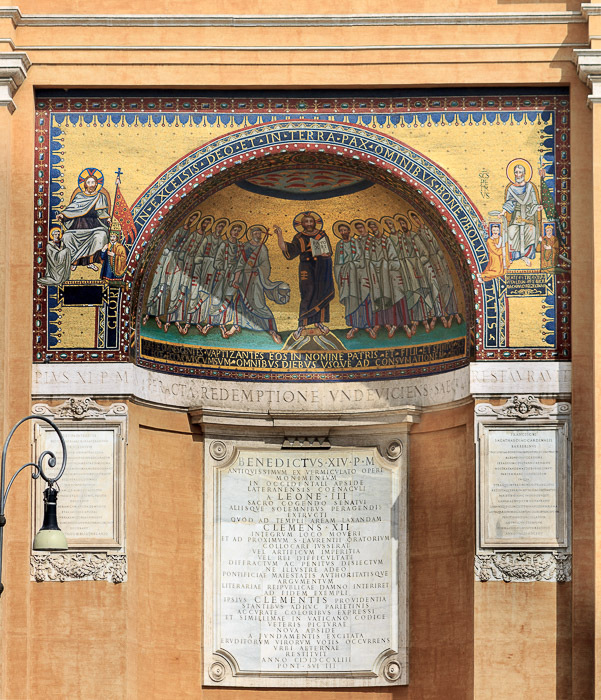 On the far left is Paschal, with the square halo of the living, hoping his offering of a model of the church is enough to guarantee his place in heaven. 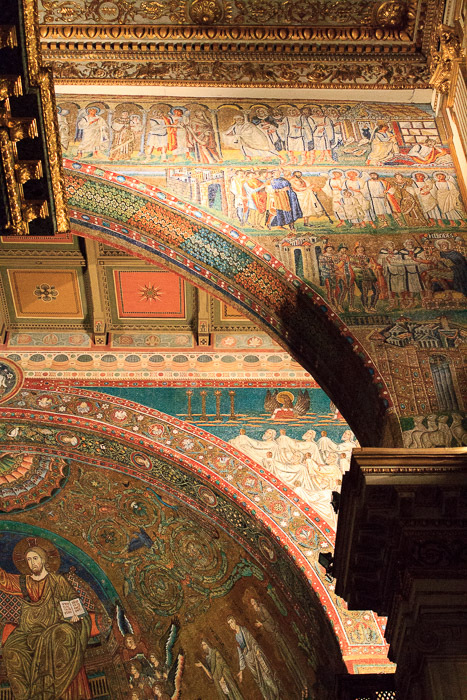 There are also mosaics in the chapel of St. Zeno (3rd and 4th photos below). 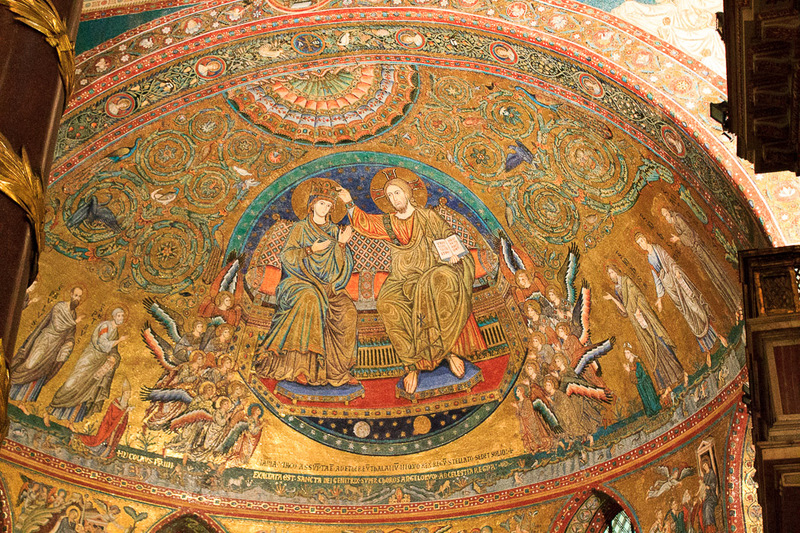 At the top of a spiral staircase is a small room with a fresco cycle dating from the 8th century depicting St. Praxedes. 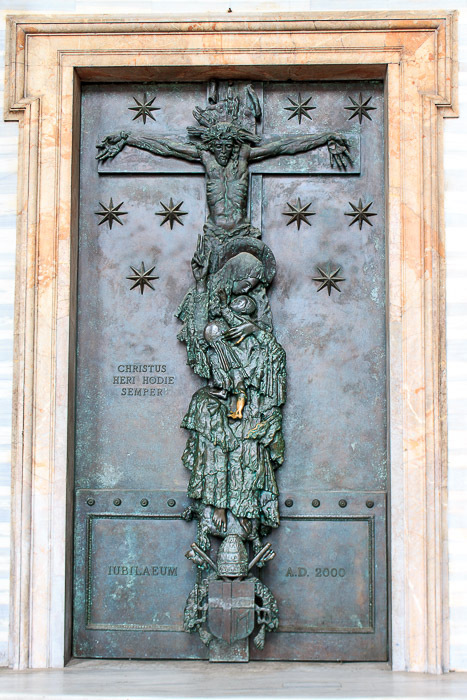 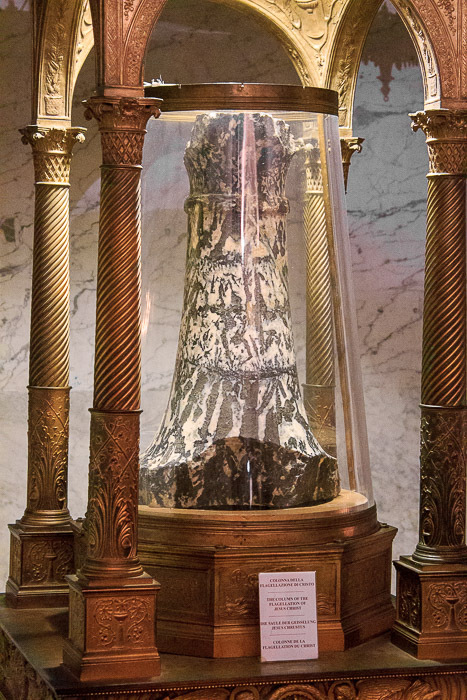 Finally, Santa Prassede houses a segment of the pillar upon which Jesus was flogged and tortured before his crucifixion (2nd photo below) in Jerusalem, retrieved by St. Helena (mother of Constantine) in the 4th century AD. 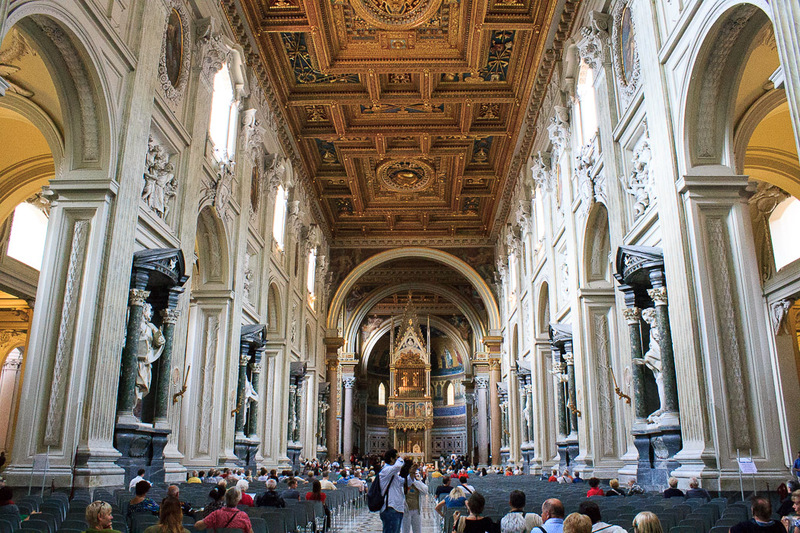 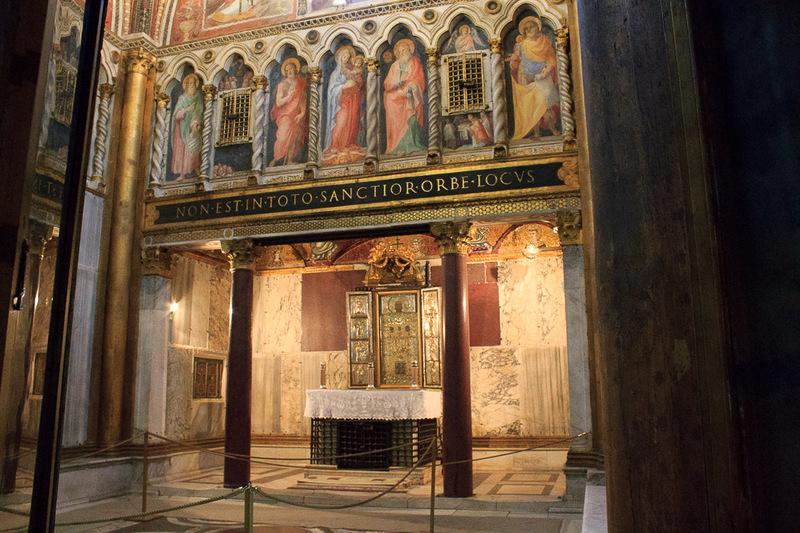 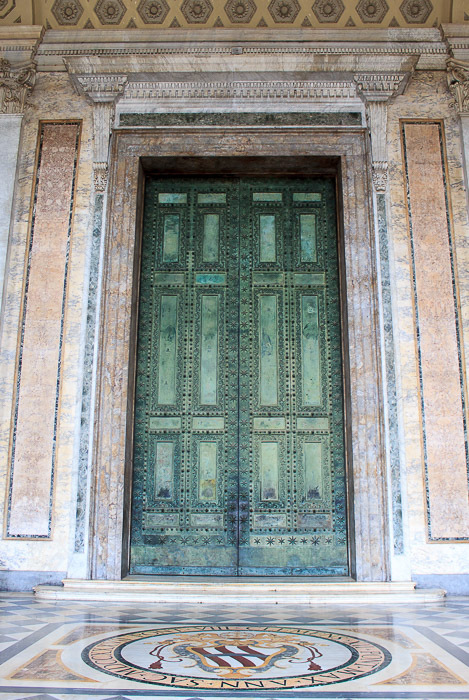 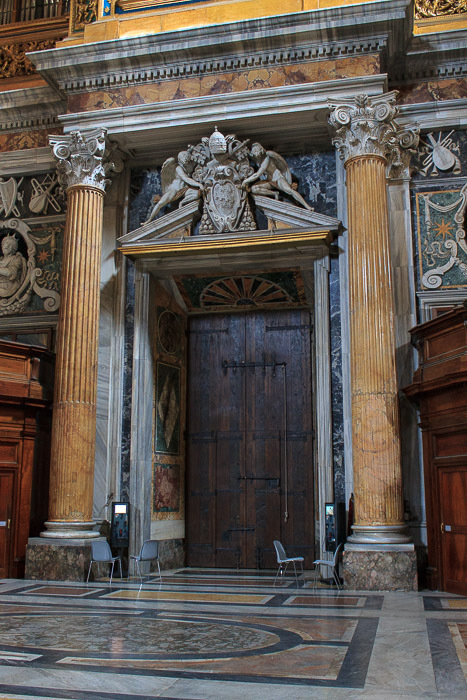 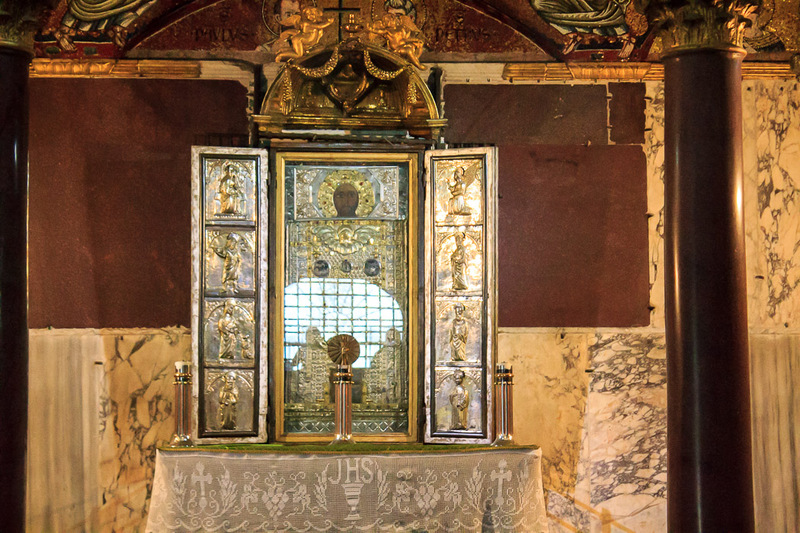 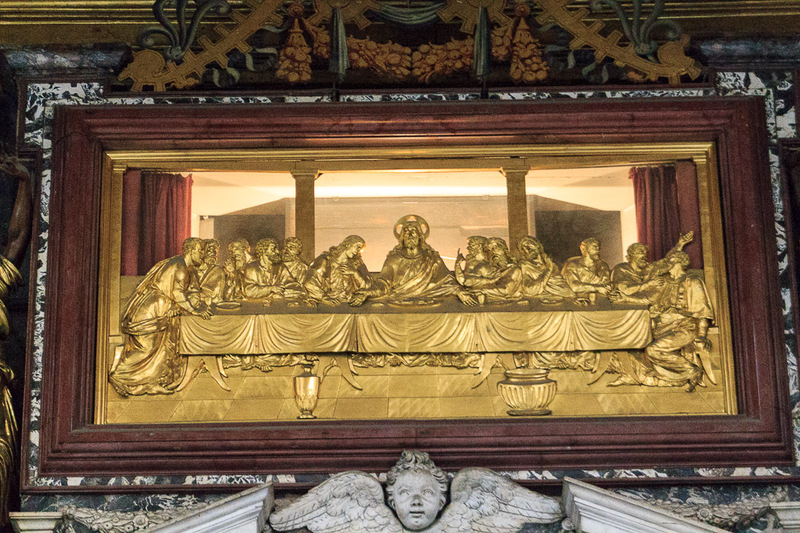 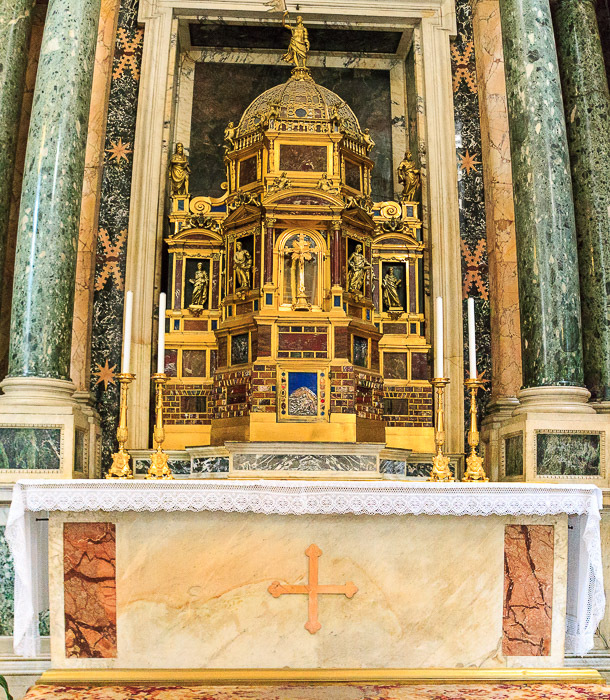 She also retrieved wood from Jesus' crib now housed in the nearby Santa Maria Maggiore. 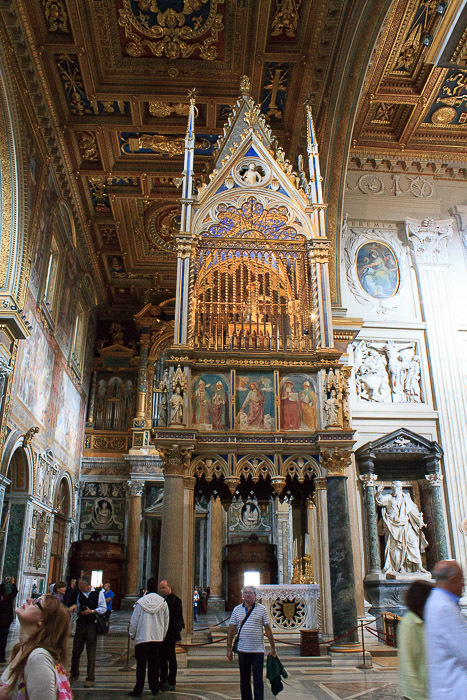 See all Santa Prassede photos. 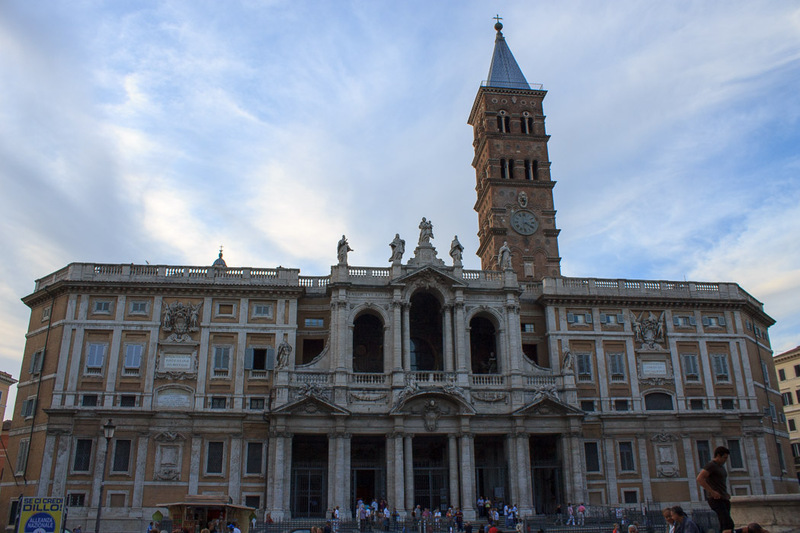 Go back out to Via Merulana and go to the Piazza Santa Maria Maggiore. 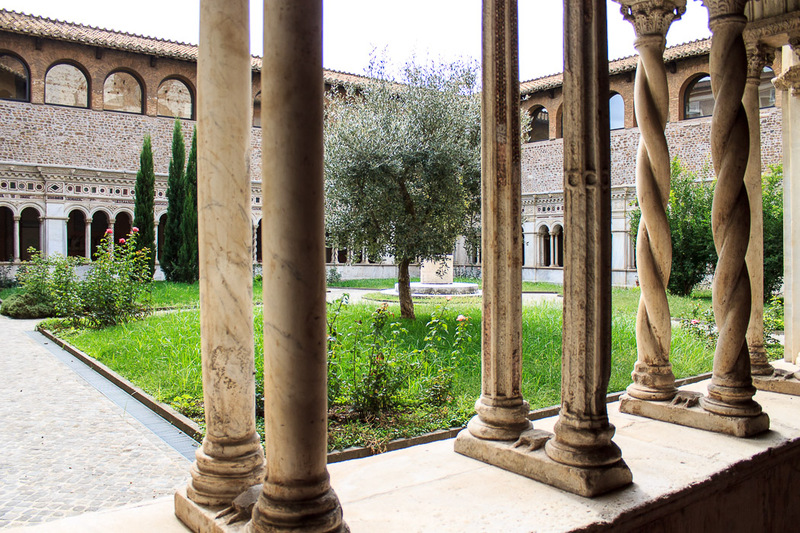 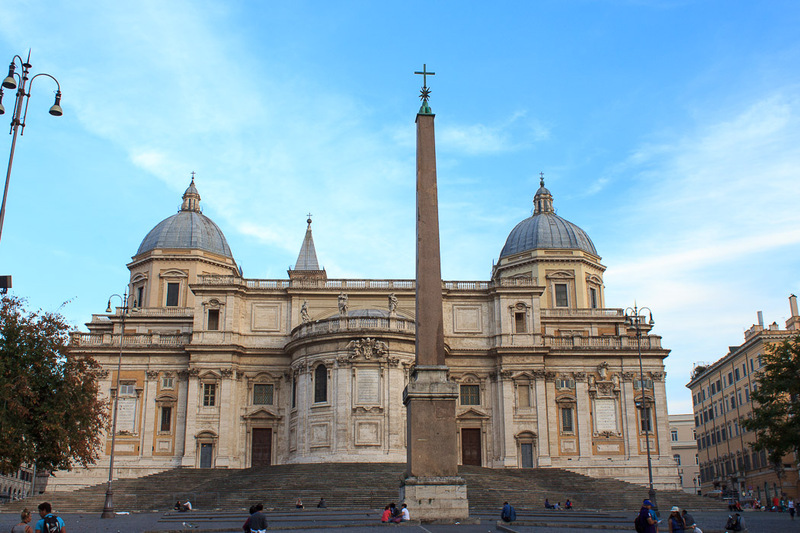 In that piazza is the Column of Peace with the Fountain of Santa Maria Maggiore next to it. 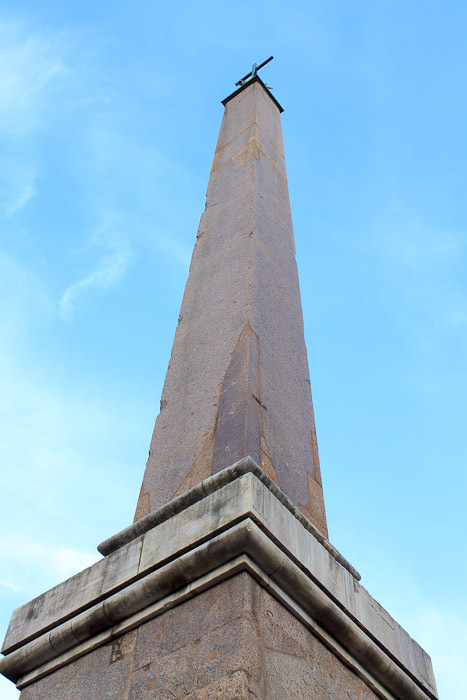 Around the back of Santa Maria Maggiore is the Piazza dell'Esquilino with the Esquiline Obelisk in it. 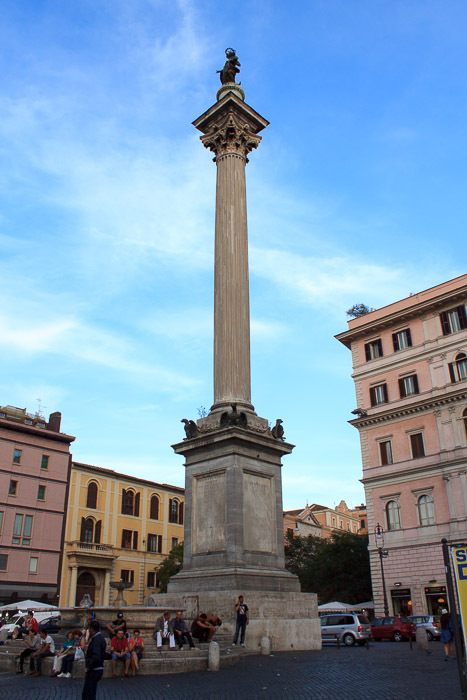 The road on the opposite side of Piazza dell'Esquilino from Santa Maria Maggiore is Via Cavour. 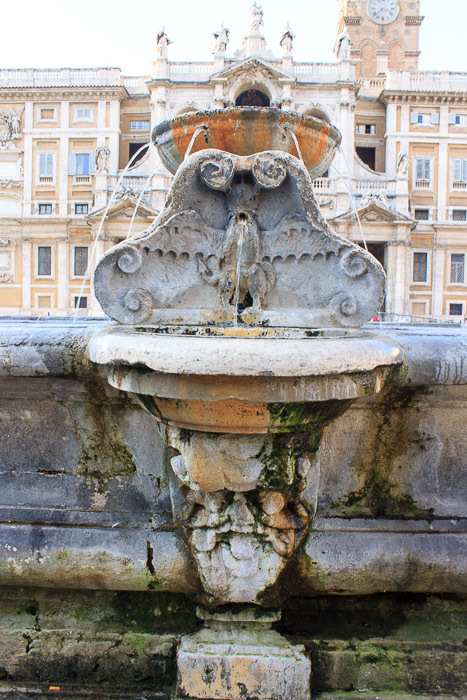 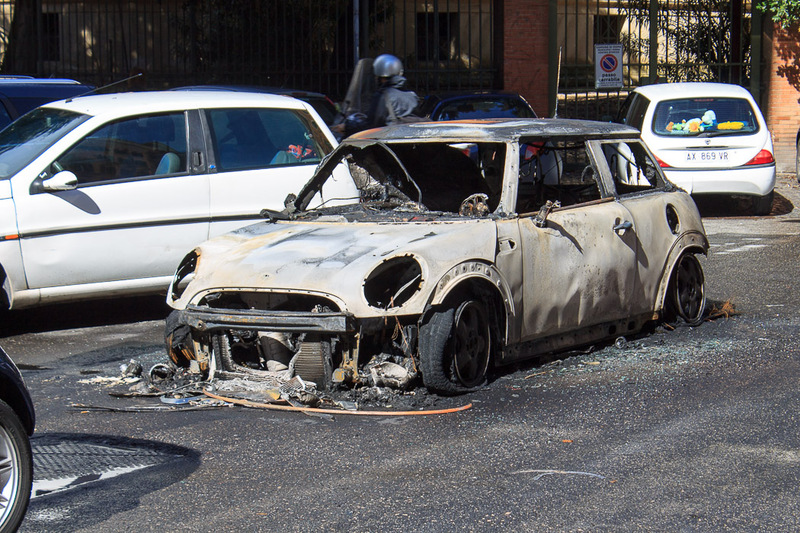 Walk right along Via Cavour to reach the Termini metro stop, or left to reach the Cavour metro stop.